At the NASA lab, the drivers have begun to practicing to operate the robot for the upcoming tournament at Waterloo. One group of students used a defensive robot to block Barrage, while the other group used Barrage to score. The drive team decided to create a drill board to hold their drills so they could keep all their drills in one place, allowing them to keep the lab a much more organized place. 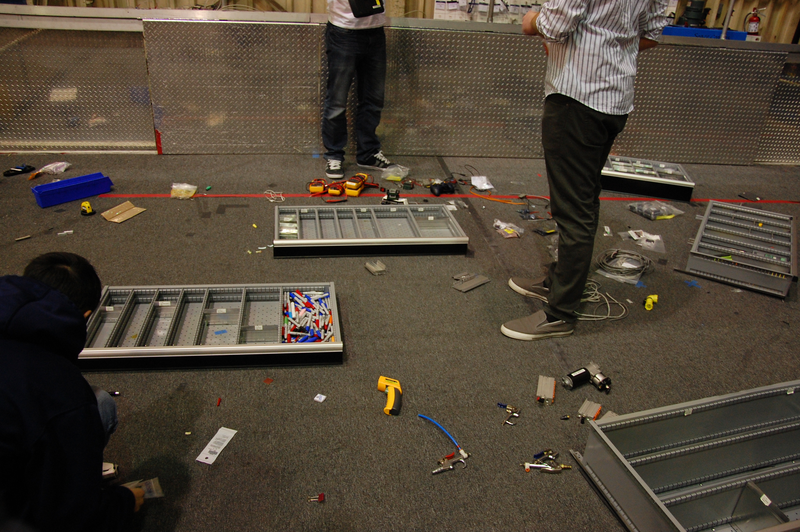 The drive team had to get off the field when the belt on Barrage broke. They removed the flywheel so that they could replace the belt. Several members began treading the wheels for the robot, beginning by putting the treads into the tread gauge. 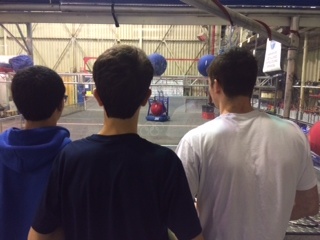 The day began with students and the drive team practicing and troubleshooting the robot. The drive team traversed the field and practicing scoring goals as quickly as possible. 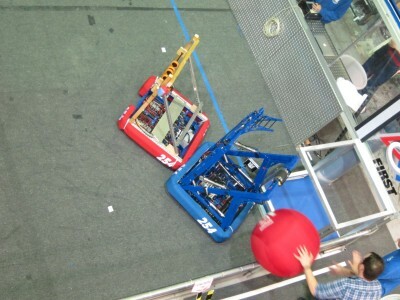 After Skystalker, the surrogate opponent robot, was up and running, the driver practiced scoring with its uncooperative counterpart playing defense (see image below) This accustomed the driver to moving around the field with an opposing robot attempting to block movement and impede shooting. 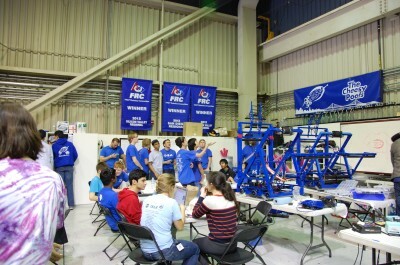 During a half hour window of robot downtime, students attended to other projects. Students installed lighting in the battery cart and added a vinyl finish. 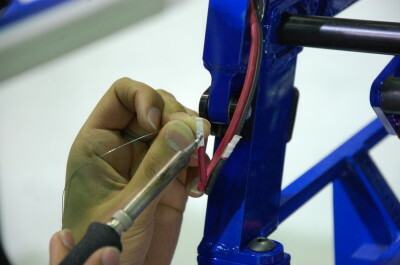 Meanwhile several other students worked on improving the wiring of Skystalker by loosening its chain for the drive train. The main piece of organization was the continued efforts on the Bill of Materials, pronounced Bom in airports, needed for Madera. 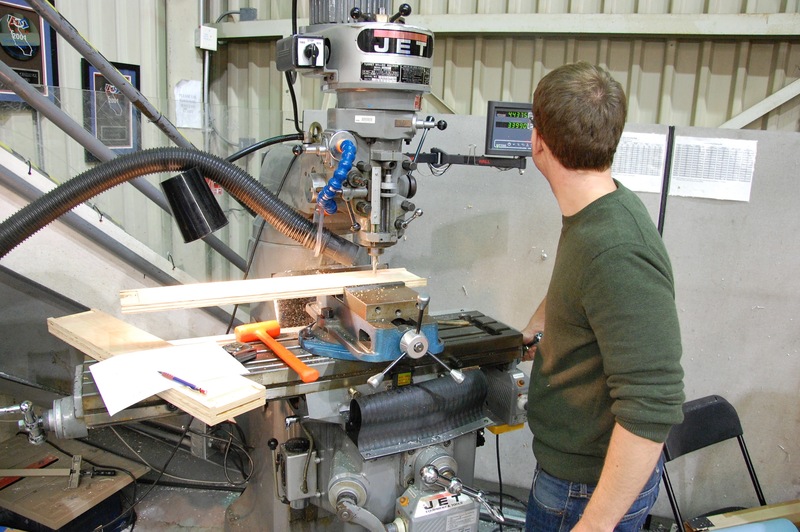 The BOM will describe a list of the raw materials, sub-assemblies, intermediate assemblies, sub-components, parts and the quantities of each needed to manufacture an end product). Several student worked on completing the SolidWorks CAD tutorial to improve their practical knowledge of CAD. 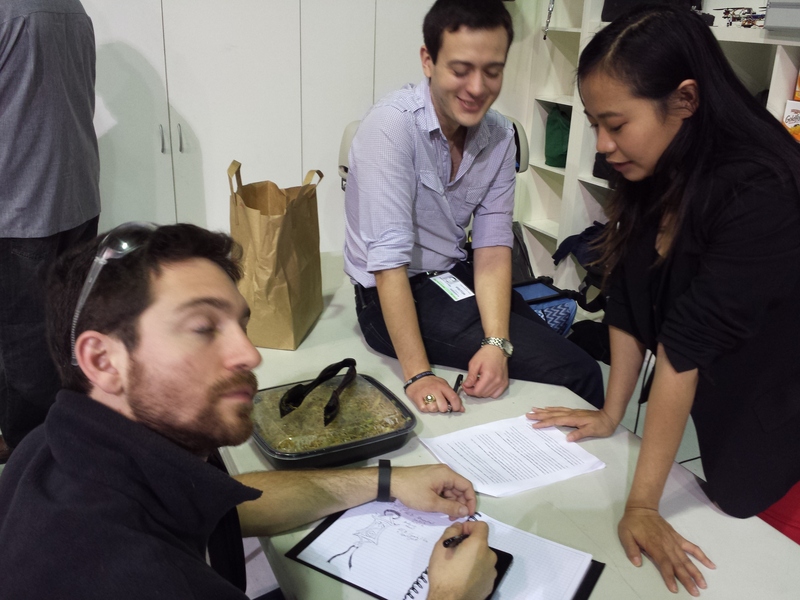 The majority of them created sketches while others put together assemblies. A team worked on the Chairman's Award presentation PowerPoint for the upcoming Madera tournament in March. A leader began to finalize the script. Remember that our Chairman's presentation is confidential and should NOT be shared or discussed outside of the team. 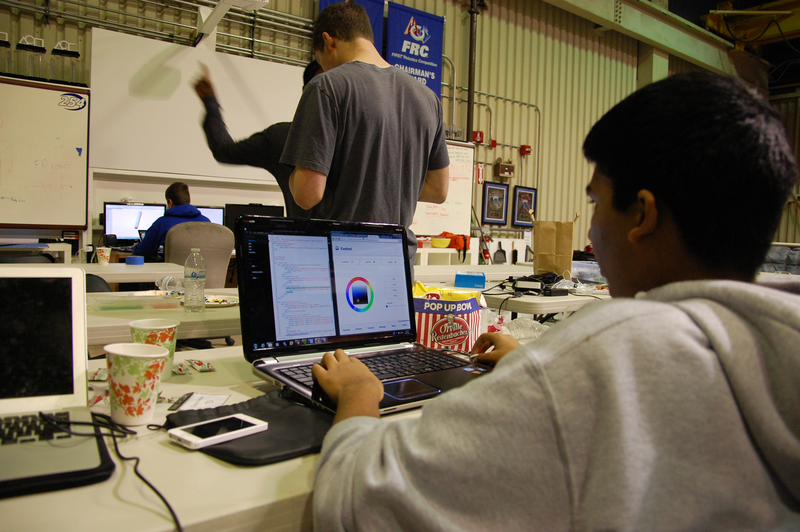 Another team worked on the Media and Technology Innovation Award that is due tomorrow. Its content was finalized with approval throughout the team and the graphic design and layout format will be finished tonight. 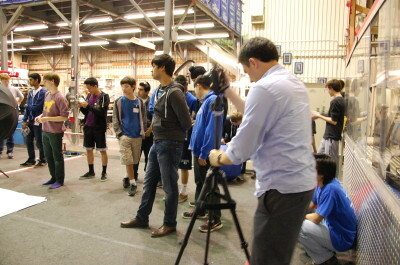 Upstairs, students had a discussion on how to improve the robot and what will definitely will happen. We will be adding the side panels for giving proper recognition to all our amazing sponsors. Two suggestions were adding triangular plates onto the side of the robot to assist in catching, and another involved the addition of surgical tubing to strengthen the catcher. 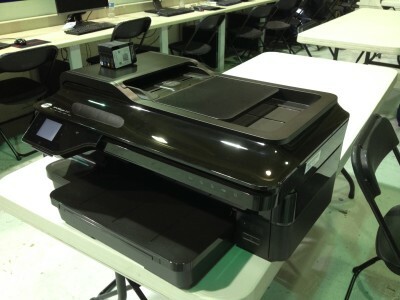 The lab received a new printer, scanner/copier, and 24" monitors. With the recent rain, a few students noticed a small leak in roof on the east side of the lab. 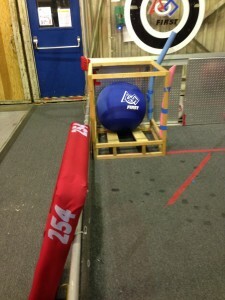 The team also played some pick-up volleyball with an exercise ball and the truss. This year we have had the unique privilege of working with some new and awesome mentors. Over the next few weeks, we will be giving them the opportunity to talk about how FIRST has affected them. What is your occupation? How did you get into it? I am currently not working anywhere. I am spending my time on side projects involving robotics design which I may turn into a business. 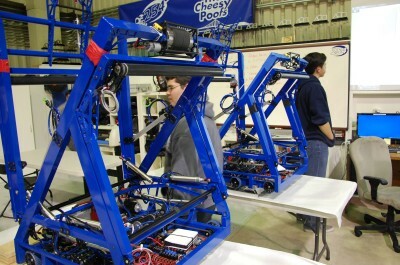 Most recently, I was a Mechanical/Robotics Engineer at Double Robotics. I have been friends with the founders of the company for over a decade when we all were working on Battlebots. Since then, I have recruited my boss for side projects, and we kept in touch. When did you get involved in FRC? I got involved in FRC when I found out about it at WPI. 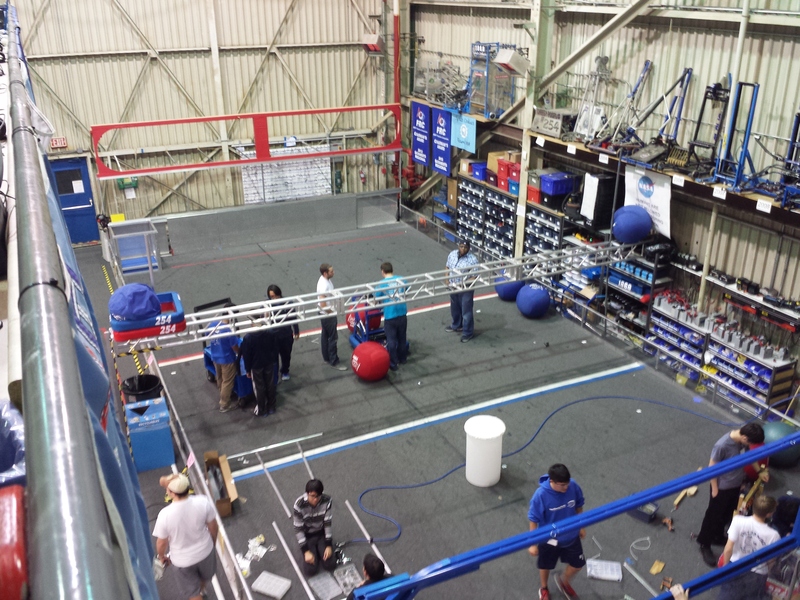 FRC Team 190 was working out of the same lab I was building Battlebots in. I have been involved since kickoff 2006. What was your favorite FRC game? I enjoyed watching 2012 the most. 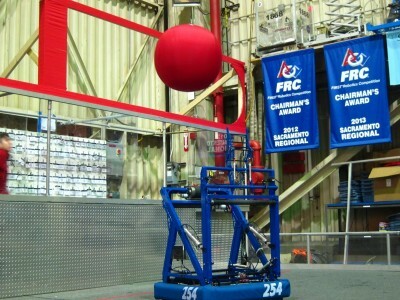 It was very exciting watching the best robots scoring baskets quickly, and then always exciting at the end with the risky bridge balancing. 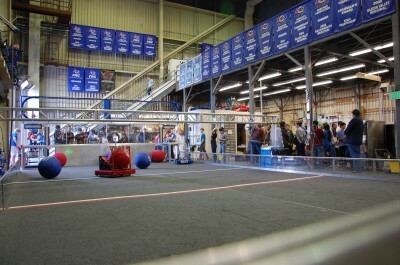 2011 was my favorite year for robot design and competing. We had a very solid and unique design which was very satisfying. 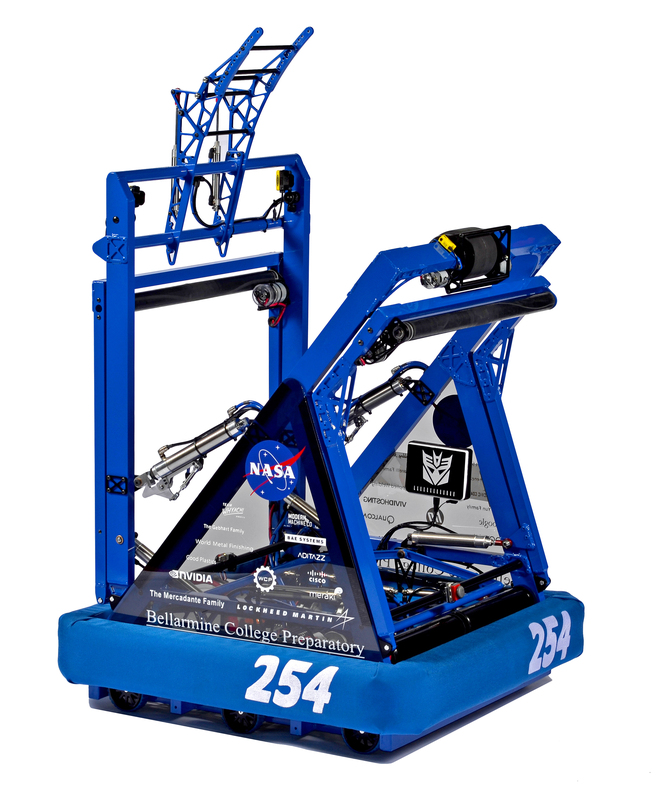 How did FRC interest you? 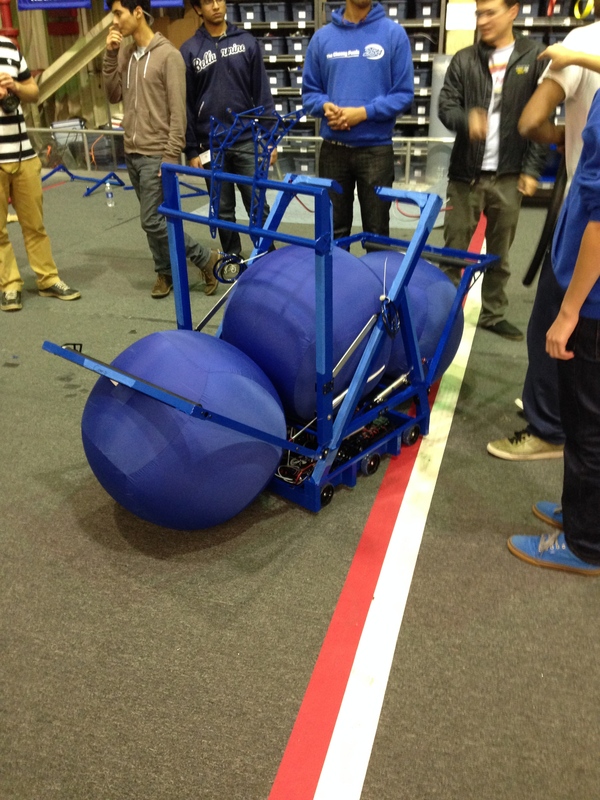 I love engineering, but I love engineering competitions even more. I am not really into any other sports (besides sailing), but I love the competitive nature of FIRST. It is not all about winning, but it is competitive to see who can come up with the best design quickly and easily. Mentoring students interested in robotics is really fun. I have a lot of experience building things quickly and reliably, and I am glad to share that with others. How has FIRST affected you? FIRST has a huge community, so it was an interesting place for me to learn from others and meet new people. I have many lifelong lasting friendships through FIRST. I have met business contacts and people which have led to amazing opportunities. FIRST has done a good job of focusing me, and giving me some structure, even if for only 6 weeks out of the year. It is something I look forward to and prioritize to make time for in my life. It has taught me so many engineering skills, new parts I have never seen, new methods, and refined my CAD skills. It also taught me a lot about working with teams of people and how to handle communication issues. 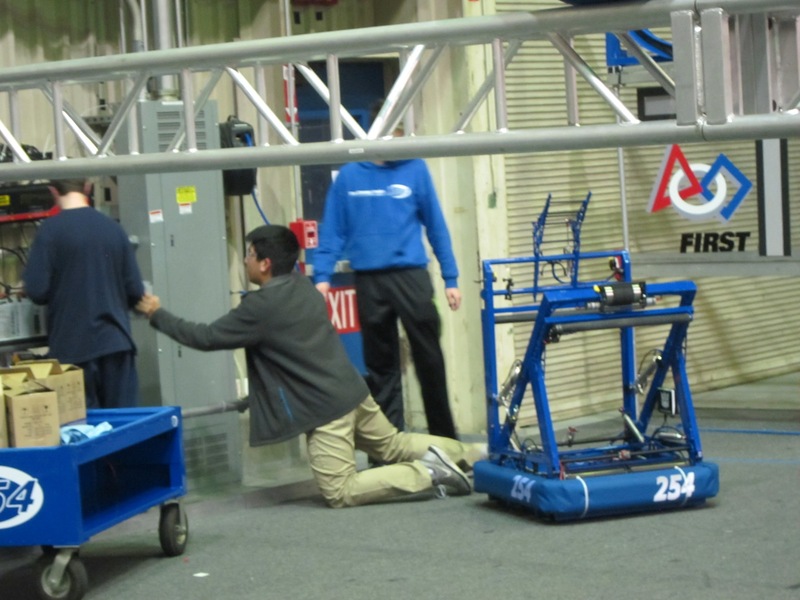 How many FRC teams have you worked with? I have worked with 190, and a little with 1735, both out of Worcester, MA, before 254. What area do you mentor in ? I mentor in all things mechanical, design, overall geometry, parts sourcing, machining, etc. During the build season, I am full on. Every day at the lab from about 5:30 until midnight weekdays, and 1 to midnight on weekends. During the season I took 4 days off. When I am not at the lab, I try to spend as little time working on anything FIRST related, although my mind is still thinking about solutions to problems. Also I spent a lot of time during the day physically bringing parts to and from our sponsors shops for welding or finishing. How does your profession affect your approach? As a robotics engineer, it is precisely what I do. 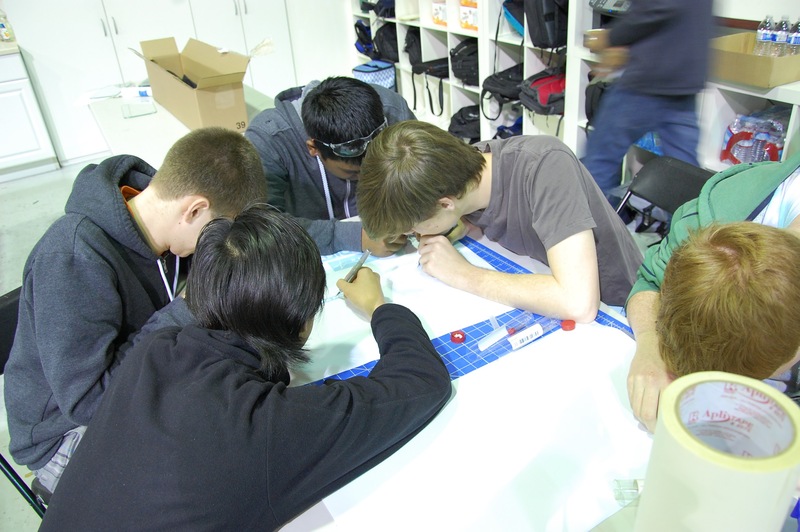 Having a tough new challenge, brainstorming solutions, prototyping, designing, and manufacturing. 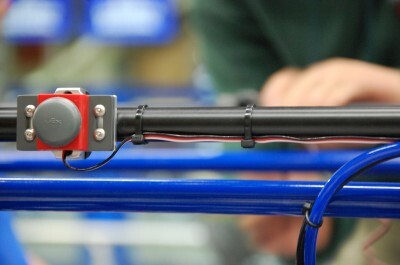 All of course while maintaining a low project cost, and getting it done quickly. I approach FRC the same way I do any other engineering problem. I always look first at what others have done, do research, and ask a ton of questions.Then I try implementing a best estimate immediately and getting feedback for revisions. Why did you decide to help with Team 254? I have always admired the 254 creations. I have spent many hours looking over every picture I could find, and reading available information. It is one of the most professional teams, and I have always wanted to work with those mentors and students. I also think it is a very special privilege to be working out of a NASA facility with so much history and prestige. What do you expect to see from students in FRC? I expect a lot of hard work over time, and a lot of learning and improvement. When someone is not working hard, or quickly, I expect them to ask someone else how they can improve, or what they can be working on. I think all things can be solved by asking tons of questions and learning, so I always wish people would admit more often when they are unsure about something. I expect students to be here having fun, because they want to be here, and not feel forced. 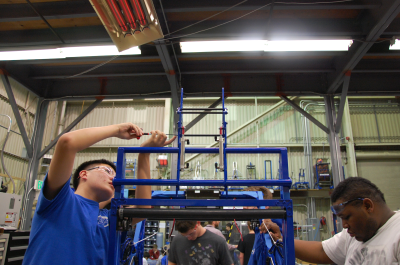 Do you feel that FRC helps students prepare for future careers? Yes, it helps dramatically. 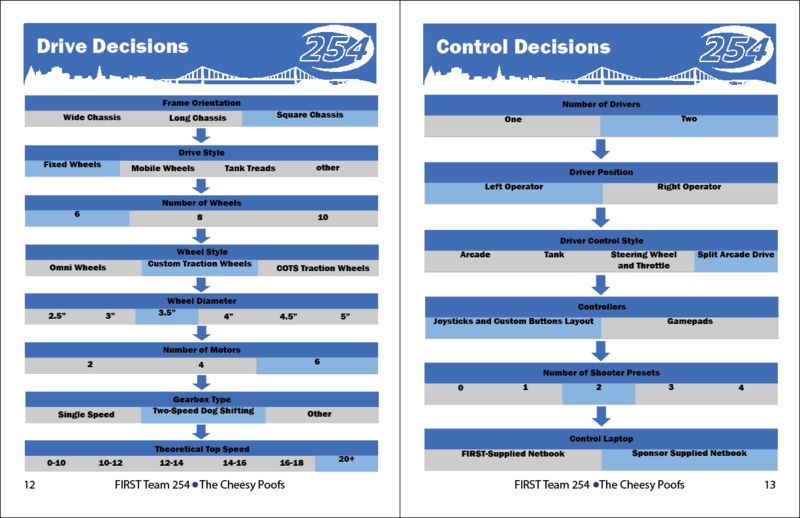 Some teams are run like small businesses, very professionally.They will learn about communication, deadlines, and real world project consequences. They will learn a ton about working with teams of people, and how they will not always get along with everyone. They also learn how to behave around industry professionals at events. I build bar tending robots, fighting robots, go sailing, go to the beach, and eat smoked BBQ. What is your favorite FIRST memory? Being on Einstein after winning champs in 2007 is right up there, also getting to play CRUD with my old team at the end of ship day each year. What is your most valuable FIRST experience? The most valuable experience was going to the Founder's Reception at Dean's house in 2006. That was my introduction to FIRST and where I met so many mentors. It got me hooked so quickly because I was fully immersed. From that I got to really meet my close friends from WPI which guided the rest of my education and career choices. 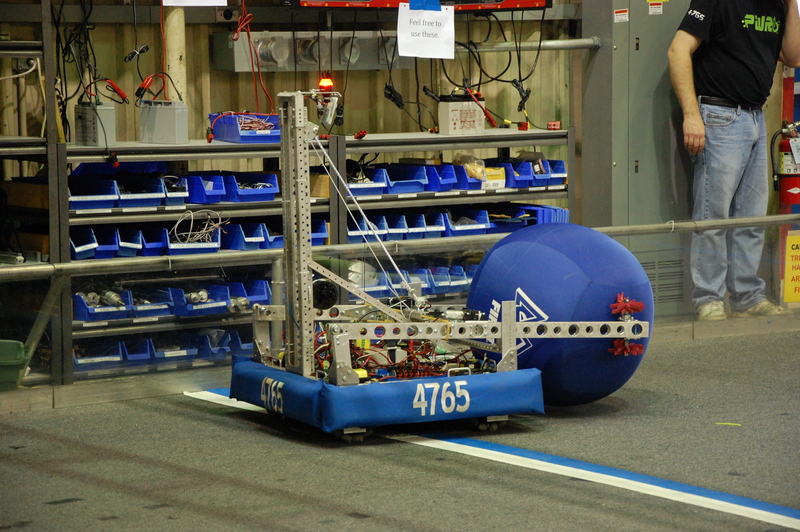 Today, students continued to practice driving the robot on the field. 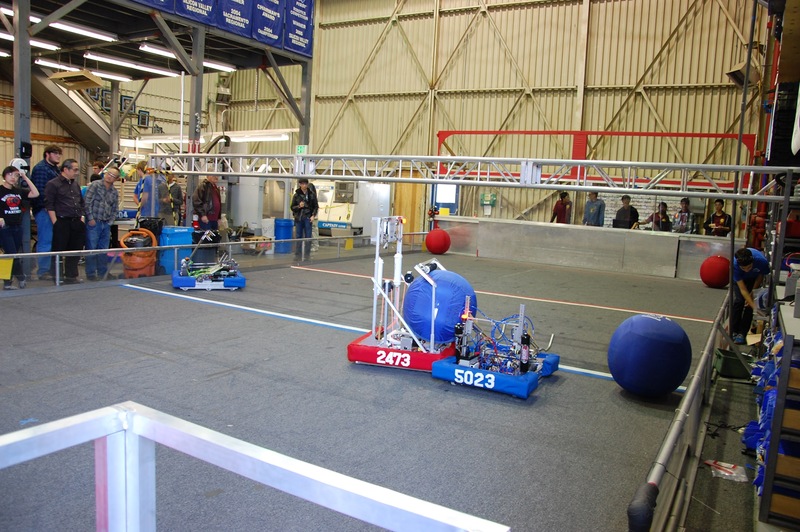 Obstacles were set up on the field earlier in the day to test the new drivers’ capabilities.Later, students practiced driving with other students in the human player boundaries feeding the robot balls. 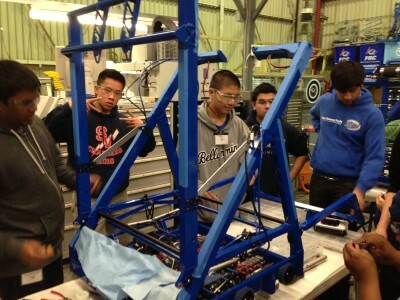 Students finished assembling the display gearbox. Students added pictures to the Chairman’s Award PowerPoint. Finding the right pictures is a big process in creating the presentation. 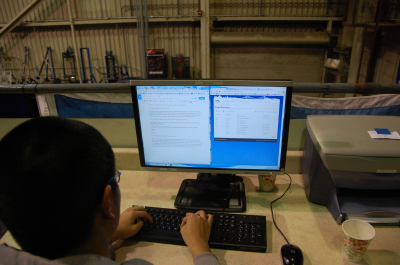 Students worked on updating the technical binder for the Chairman’s award. This binder contains all of the specifications for the robot. 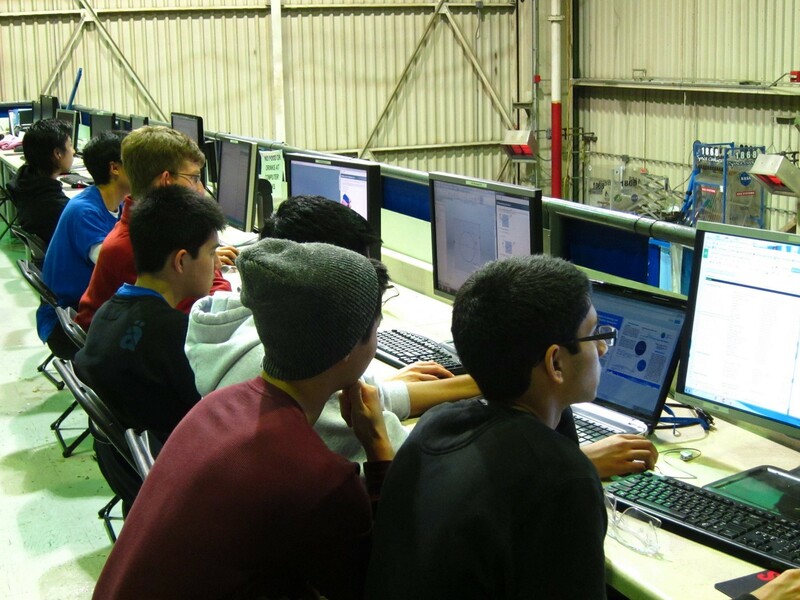 Students continued to work on drafting the Team Flyer. The flyer is an easy way toinform other teams and passersby during tournaments about the robot and theteam. This is a simplified version of the technical binder. However, after some further discussions we decided to try remaking the flyer with a shot of the robot with the intakes opened. That photo is being photo shopped now and will be used soon. 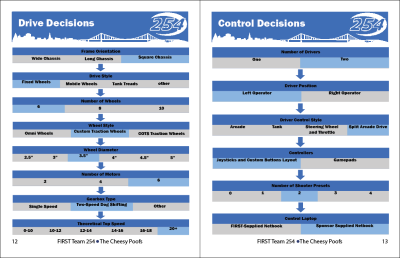 Draft of the team flyer. The Robot Name font is temporarily incorrect. 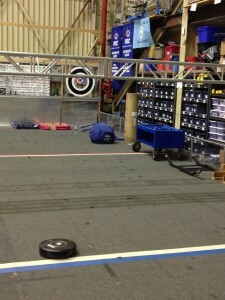 Programmers continued to work on the pit display. Currently, they are working on fixing the team page. 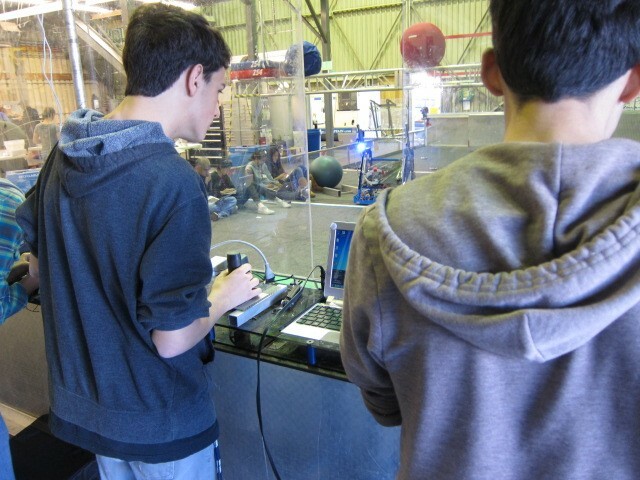 Students started to improve the field by configuring the scoring lights. 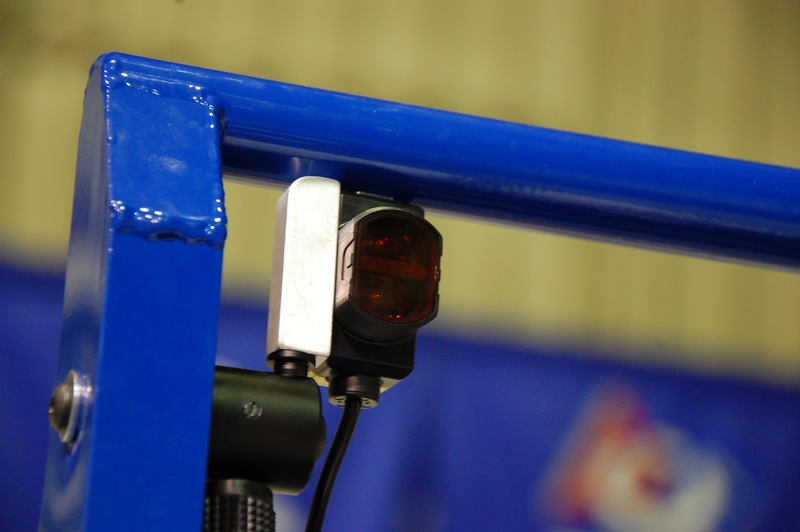 These lights indicate whether the robots are in autonomous or in tele-op mode. This will help simulate a real game for driver practice. Students programming the scoring lights that go around the goals. The lights are now working! 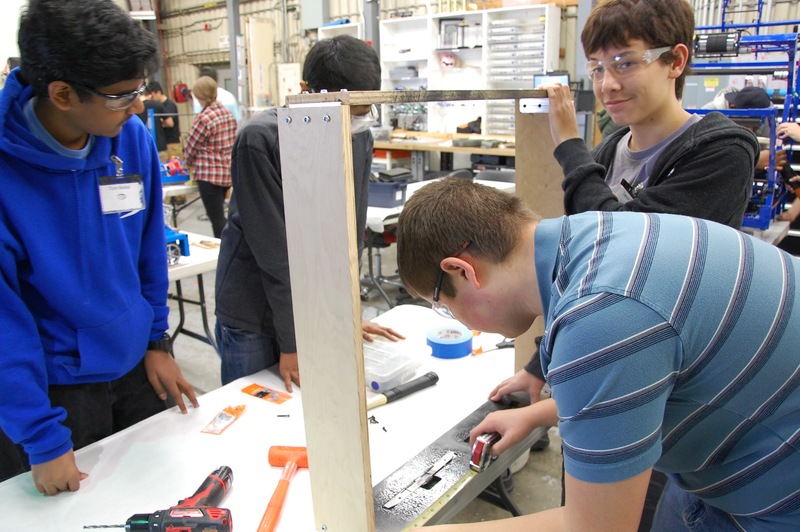 Students began constructing an intake on-top of the Overkill Practice Drive-base made of wood for a drivers to face-off against. Milling brackets for holding the intake shaft for the test robot. Students continued working on the Bill of Materials. 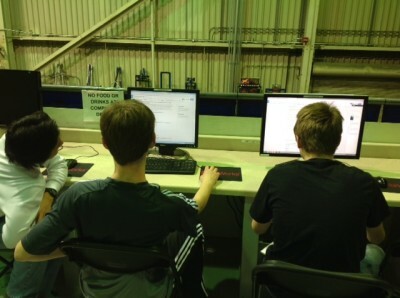 Today they finished recording data for the intake, electronics, and are currently working on the hood. 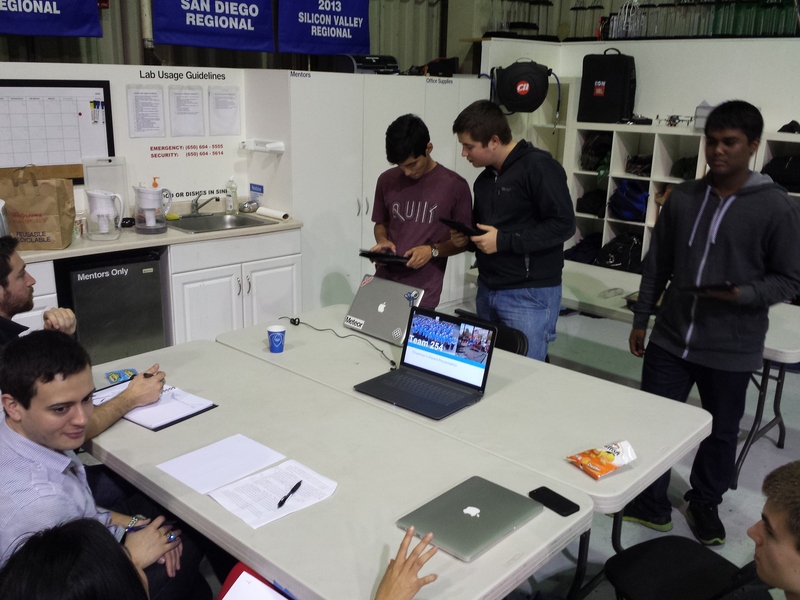 Today students brainstormed and storyboarded the 2014 Chairman's Award Video. This video is required with all Chairman's entries and the winning team's video is shown at the end of each tournament. Also, another group continued work no a Chairman's Powerpoint template that will be used during the presentation. Finally, the three presenters continued to flush out the script and got to practice 2 times before mentors and get their thoughts on what information should be added. 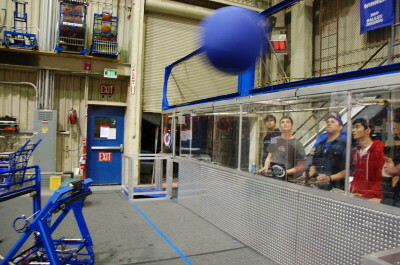 Drivers worked on receiving the ball from the human player without utilizing the rear intake. They rigorously practiced pinning the ball to the side wall to force the ball into the intake, in an attempt to lessen ball transfer time. Drivers practicing from across the field. Students finalized the field construction today by adding the human player boundaries on the side of the field. This boundary tell the human players exactly where they are allowed to stand, which help make driver practice more realistic. While drivers practiced, human players stood in the newly marked zones and fed them balls.  Programmers were brainstorming ideas for a possible Team 254 mobile app that will feature all the web products 254 has to offer. This includes the hours tracking systems, various resources (handbook, identity standards, tutorials), and the home page with a simple calendar. Students continued to program the team's new pit display. 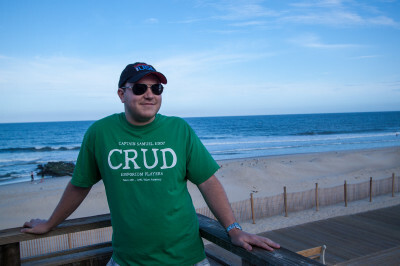 Others were adding sponsors to the 2014 T-shirt. 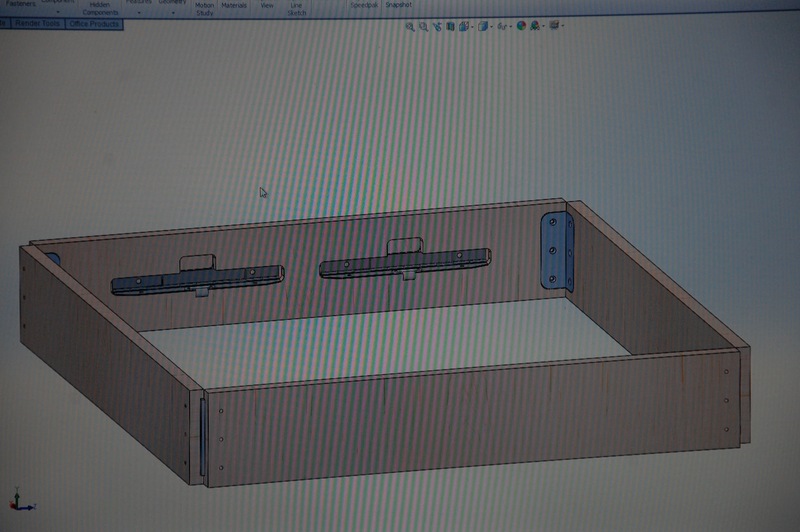 Students were also rendering specific assemblies in of the CAD for use in the Technical Binder. 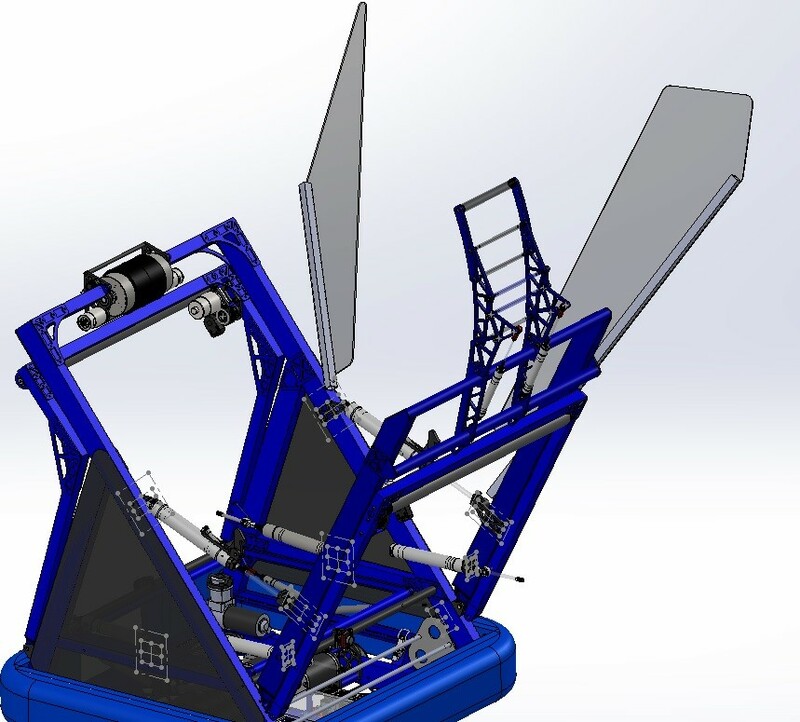 These renders all people to more easily see the functions of each mechanism of the robot and they all work independently and then come together into one finished product. Laying out the sponsors for the 2014 shirt. 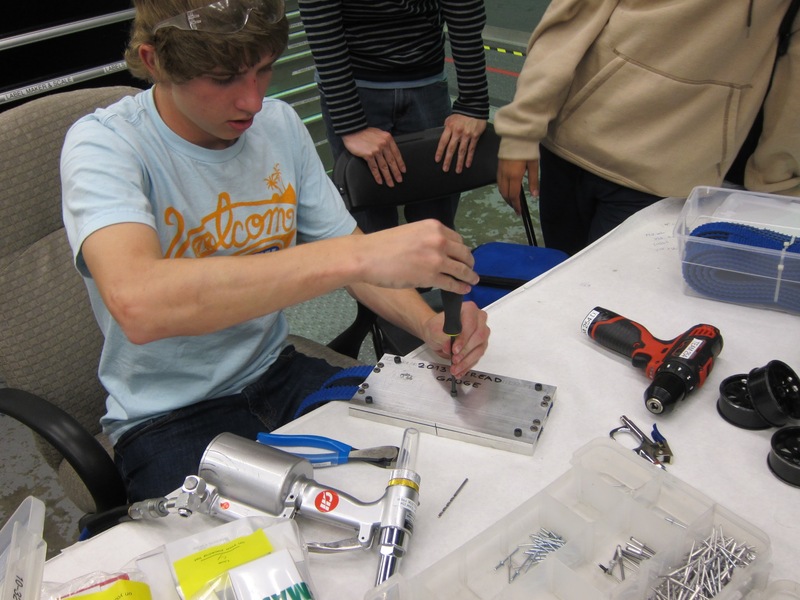 Students began to assemble the 5th, display gearbox. All the parts have been found and the gearbox simply needs to be assembled. 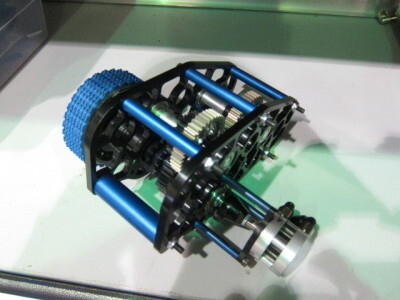 In addition to being a useful display piece to explain the 3-CIM shifting gearboxes we are using this year, this will also serve as a spare gearbox we can use or at least scrap for parts if something breaks at competition. 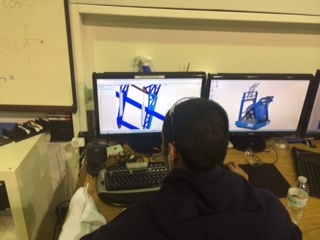 Students continued to work on the Bill of Materials (BOM) by using the CAD and Parts Management System to figure out what parts we ordered and what actually made it onto the robot. 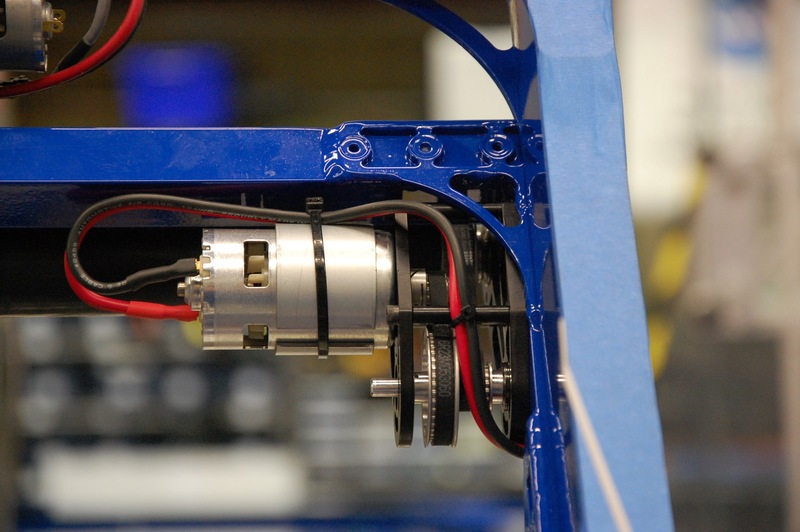 Currently the drivetrain is finished and electronics and intakes subsystems are in progress. Work on the release video made significant progress. 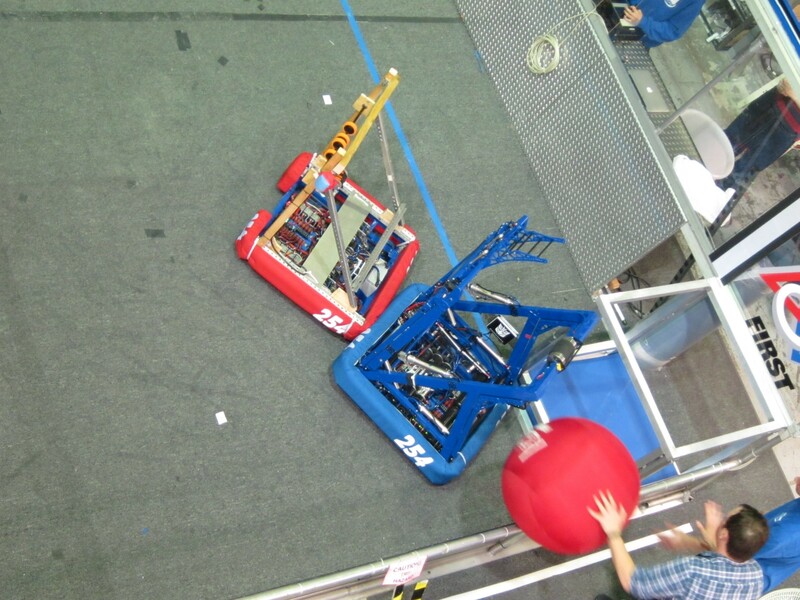 A first draft was made featuring "Light em Up" with shots of the robot and the double-3-ball-autonomous. This draft can be viewed at this link: //video.team254.com/watch/hhZjlzazqf4JTKXlP62-pq2Q3vi1pTBQ As this is only a draft and not the final copy, don't share this yet! 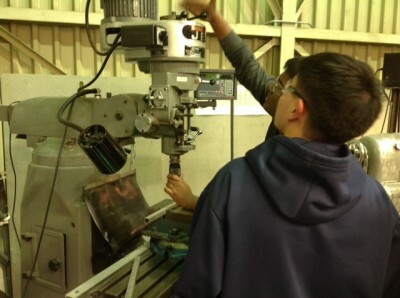 Today, students worked on replumbing the locking pistons on the practice robot to make sure it functions to the best of its ability. The team also organized the Box of Pat. 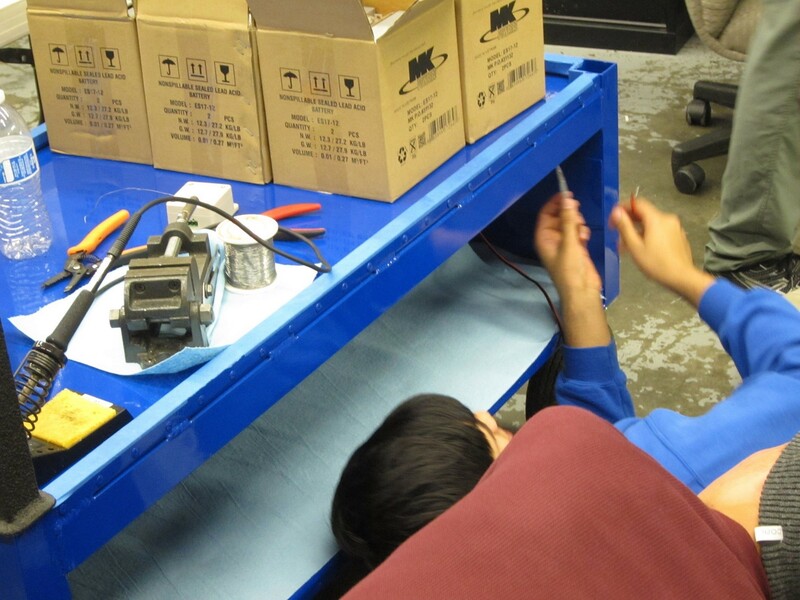 Students cleaned out the case and made sure the parts inside the shelves were placed in proper order. 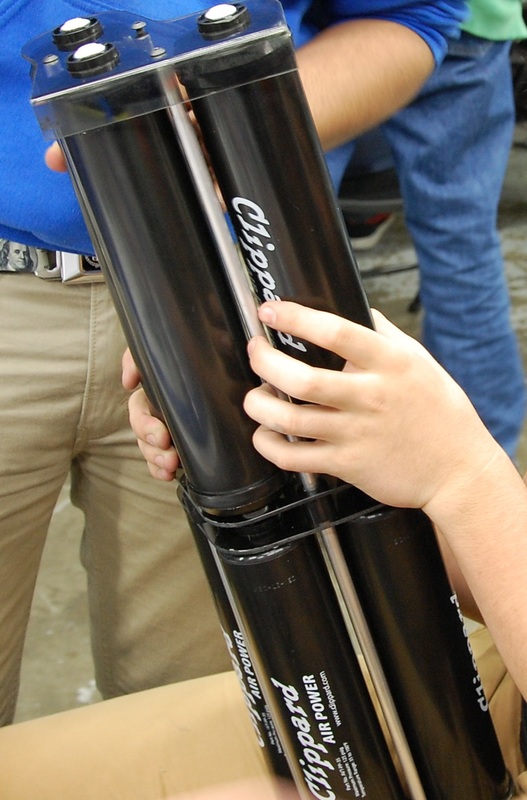 The parts were put in different compartments that would allow students to find what they need easily. The team also improved pit lighting controls. A mentor worked on the Arduino code that can be used to control the lights and students also worked on the website that controls the lights. Students also prepared for the Chairman's award presentation.They also wrote about the team’s outreach events and its basic information to display at tournaments. 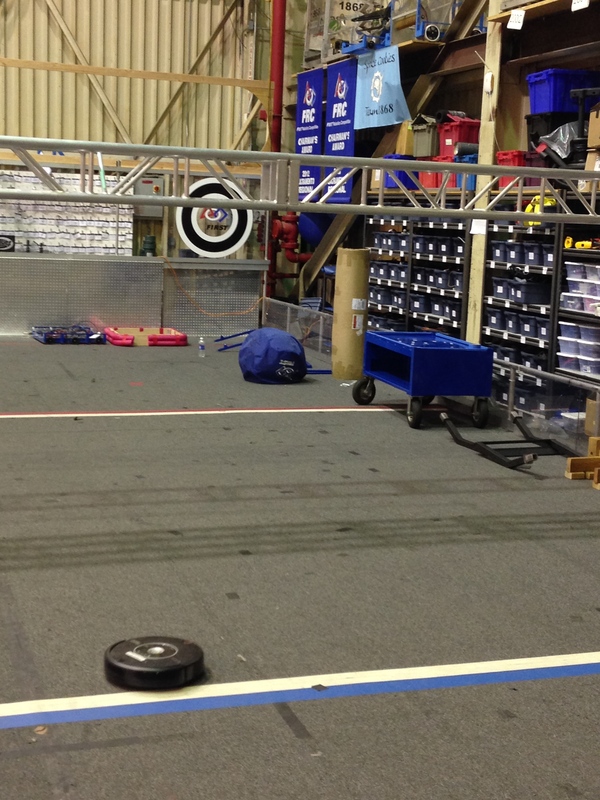 Everyone took the day off today as a reward for all the hard work we put in over the past 6 weeks to get the robot bagged! 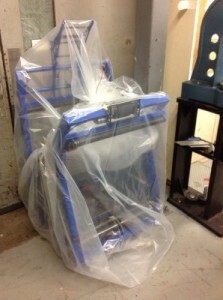 Today was bag and tag day, so not much machining or robot work occurred. 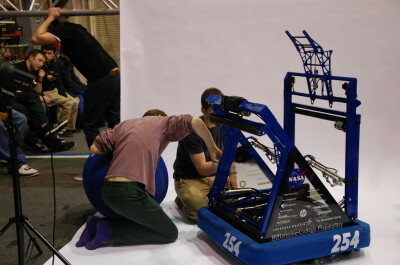 Most of the team worked on taking multiple shots of the finished competition robot, which was placed in a studio area on one half of the field. 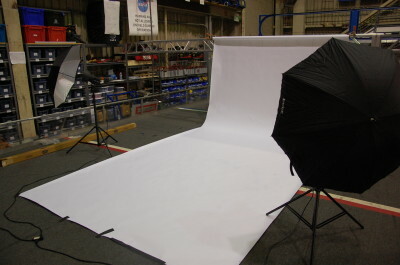 The team took photos at multiple angles with different lighting and game objects. 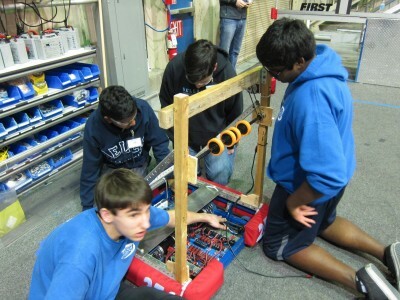 Other team members worked on improving the practice robot on the other side of the field. 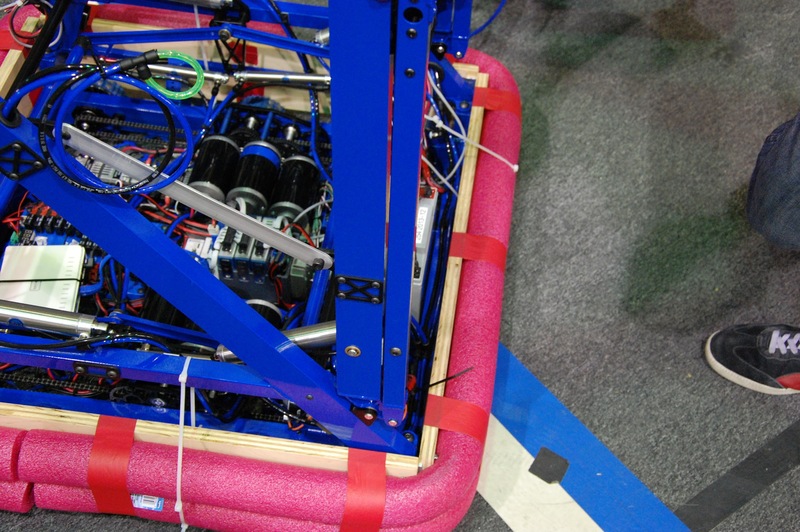 A belt broke on the robot, so team members repaired it. 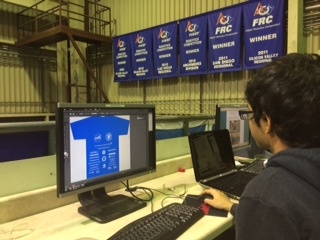 The graphic design team continued working on the T-shirt designs. A design is not yet finalized. 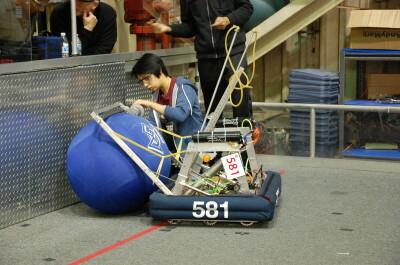 The robot was bagged and tagged at approximately 9:30, concluding six weeks of intense fun and work and ushering in six weeks of regional competition preparation. Rest day tomorrow- no build. Continue working on T-shirt and flier with Kevin. Continue working on practice robot. 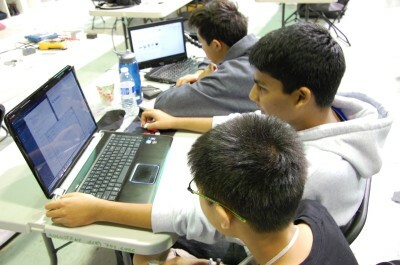 Today the programmers worked on state machines for the shooter on the robot. They have been using state machines for various subsystems on the robot in order to control and interact with them. State machines track what state the robot is in and change the state based on input. 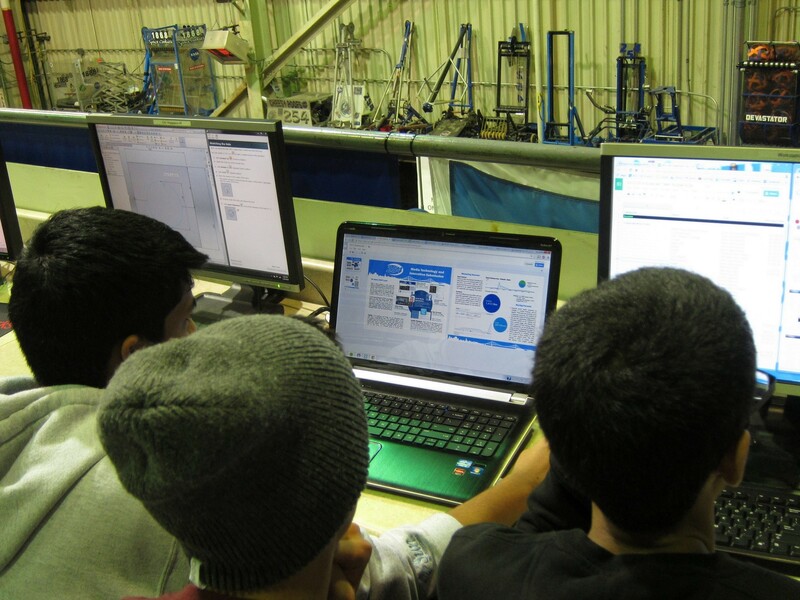 The web guys worked on creating a pit display for competition, where people will be able to view information about the team’s robot. 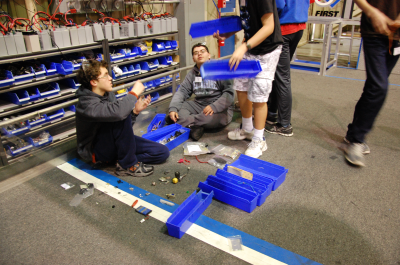 Team members worked on sorting miscellaneous parts into blue bins. 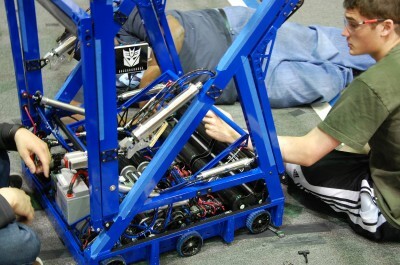 By organizing misplaced parts, the team will be more efficient at finding parts it needs. Some students worked on creating mounts made out of polycarb for the robot’s air tanks using the drillpress and the bandsaw. 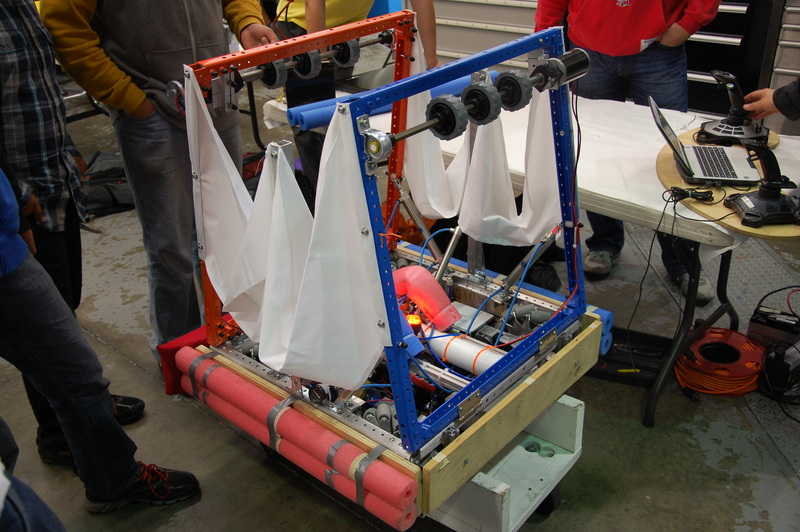 They later put the tanks onto the robot using the mounts and worked on finishing the pneumatic system. Decepticon router placed on a polycarbonate panel in the "lambda"
A couple of members worked on mounting and wiring the router onto the robot. 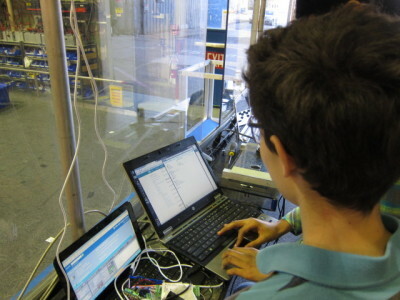 This router is the primary means of communication between the driver station and the robot. 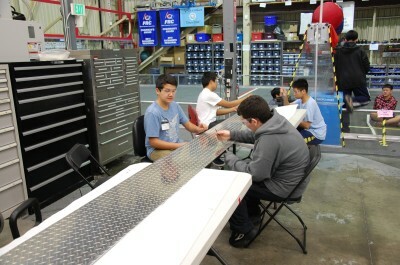 Members working on the sponsor panels took a break cutting out the stickers for the Decepticon insignia. The team also worked on finishing the red bumpers for the robot and one of the blue bumpers. 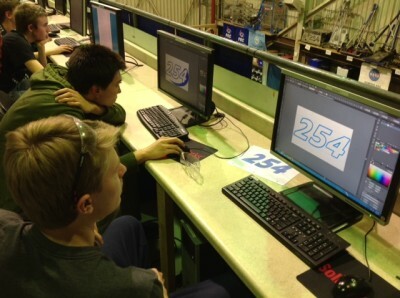 A couple other students created labels of the team’s sponsors for the side panels. The team has decided to put sponsor names on the side panels of both robots, and so far the competition panels have been completed. 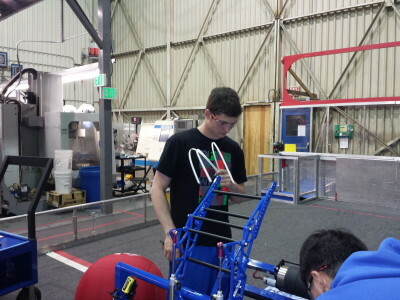 The team also worked on replacing the shifter plates for the practice robot's drivebase. 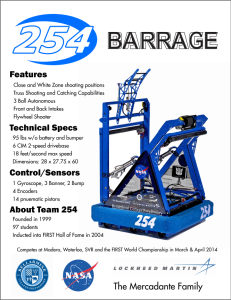 The graphics design team continued work on developing a flier to showcase the robot. Over the weekend, the software team was hard at work on 3 ball autonomous routines. Here's some video. Also, shooting on the move works quite nicely. Pictures of this event have been omitted to protect the privacy of all teams in attendance. This past weekend (February 15th and 16th), Team 254 and Team 1868 hosted their annual FRC scrimmage. 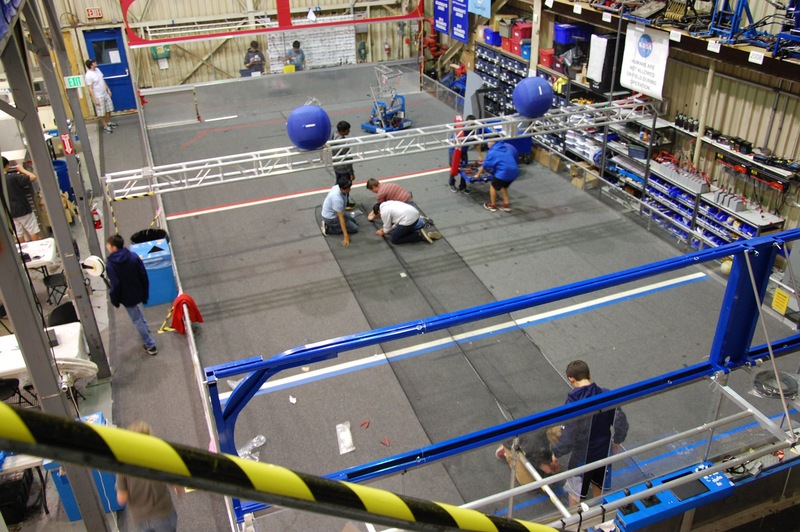 In our lab, generously provided by NASA, we are thankful to have a near full-size ﬁeld to practice on, so we opened up our lab so neighboring teams could practice before stop-build day. 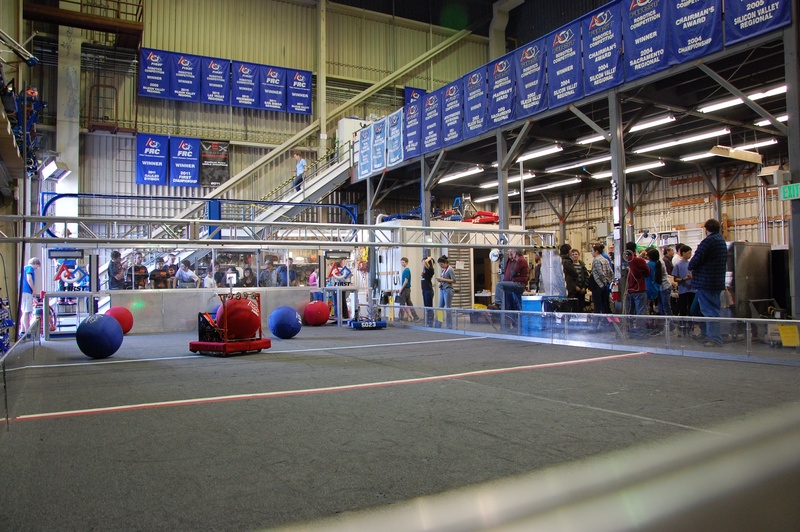 In addition, 254 and 1868 setup a full-stocked tools chest for visiting teams to work on their robots, along with snacks and drinks served throughout the day. 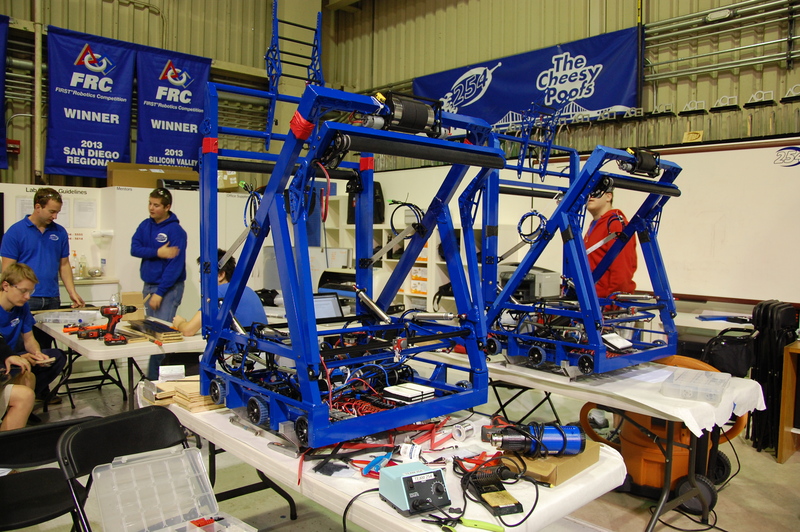 Thirty-one teams registered to attend the scrimmage, four of which were participating in FRC for the ﬁrst time. 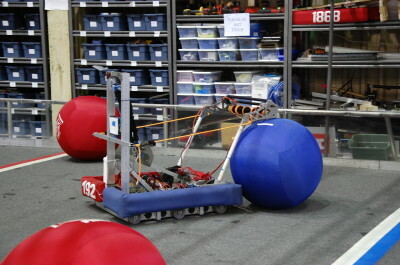 The scrimmage also gave teams that showed up the opportunity to discuss ideas about this year’s game, Aerial Assist, and preview each other’s robots ahead of competition. Moreover, we were excited to see Jim Beck, the Northern California First Representative, in attendance. 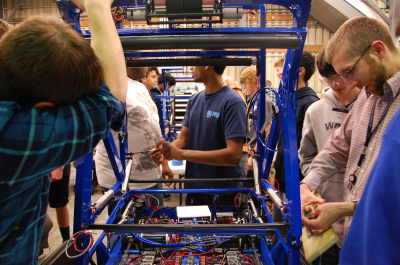 We’re always glad to help out fellow FRC teams and we look forward to our annual scrimmage next February! Today was the second and final day of the scrimmage. 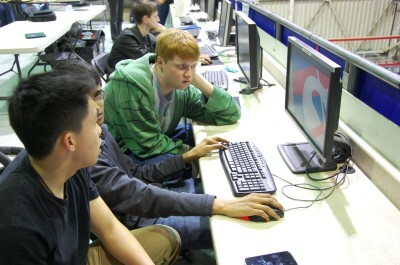 The team had a lot of fun working with and helping other teams. 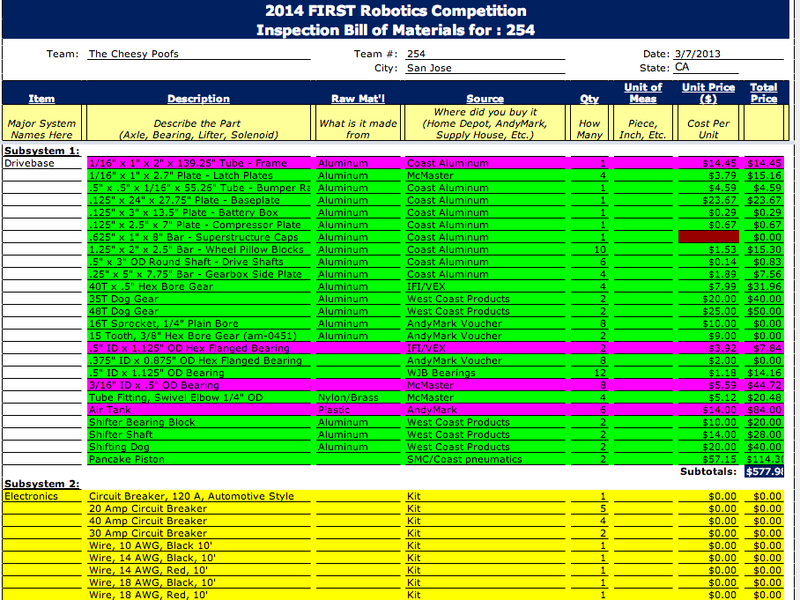 254 saw some interesting designs and robots over the past weekend. 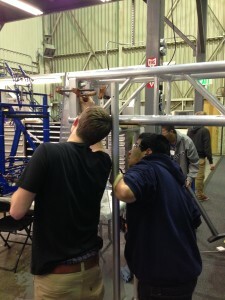 Today students mounted the sensors that will check if a goal is hot during autonomous. 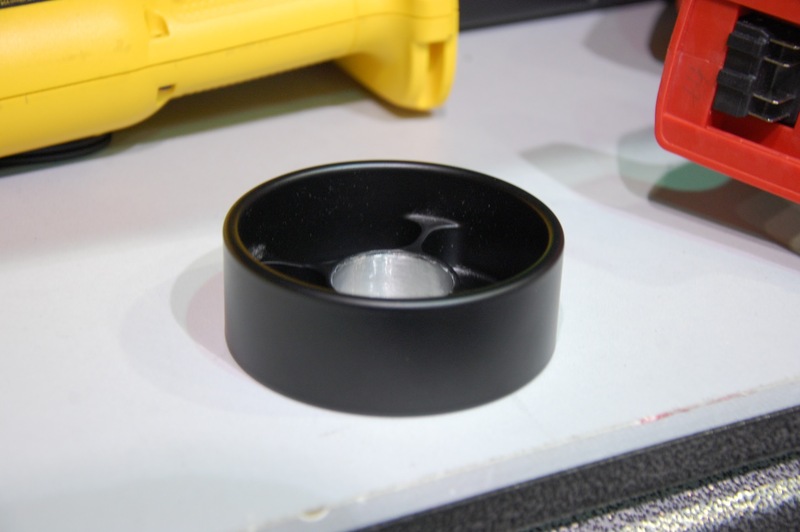 Using these sensors the team will be able to score more points in autonomous mode. The sensor will locate the hot goal reflective tape with infrared lights and detectors. 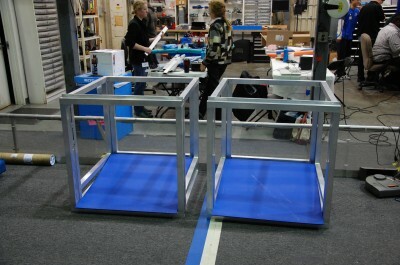 Today the team finished both blue bumpers. The frame for the red bumper has been constructed. Today students mounted both hot goal indicators for the blue goal during the scrimmage. Finally, today the team finished building the rear intake by mounting the rear intake motor and adding the shield for that motor. 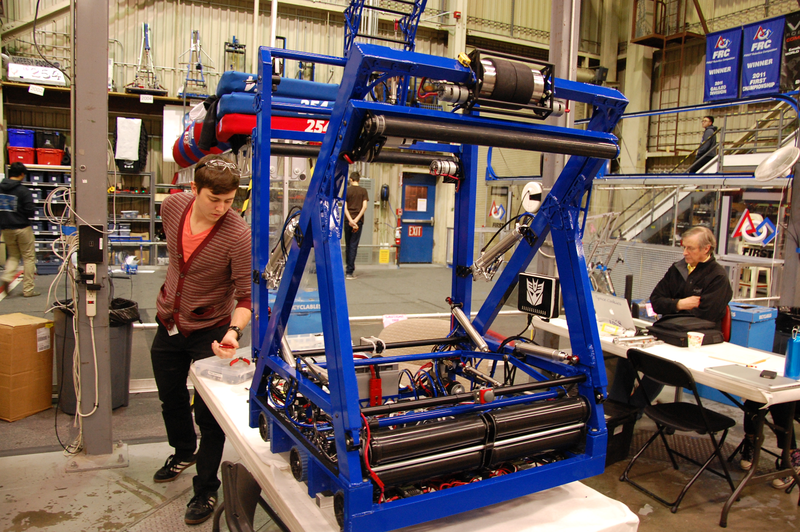 Today the team installed the catcher pistons on the competition robot and tested them. 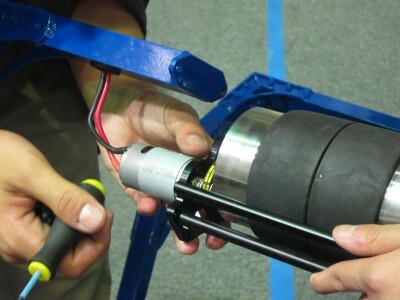 The pistons will open and close the catching portion of the robot. 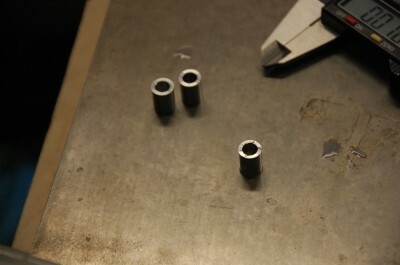 One piston on each side will move the actual frame and the other smaller piston will lock the piston in place. The day after tomorrow the final stretch of build season begins. The team will have 48 hours to complete the robot before it must be bagged and tagged. This is a key milestone in the season. 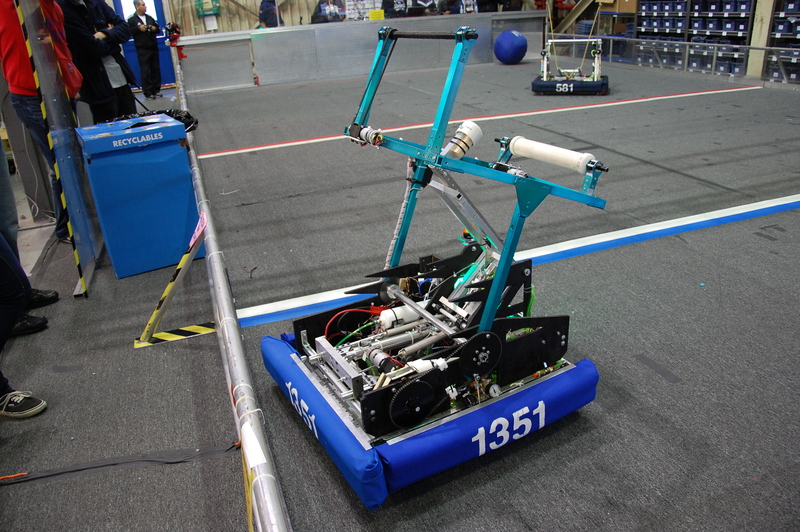 Team 604 (Quixilver), Team 192 (Gunn Robotics), Team 4765 (PWR up), Team 581 (Blazing Bulldogs), Team 1351 (TKO), Team 3501 (Firebird Robotics), Team 4990 (Gryphons), and Team 2813 (Gear Heads) all shared our lab today to practice on our almost full size field. 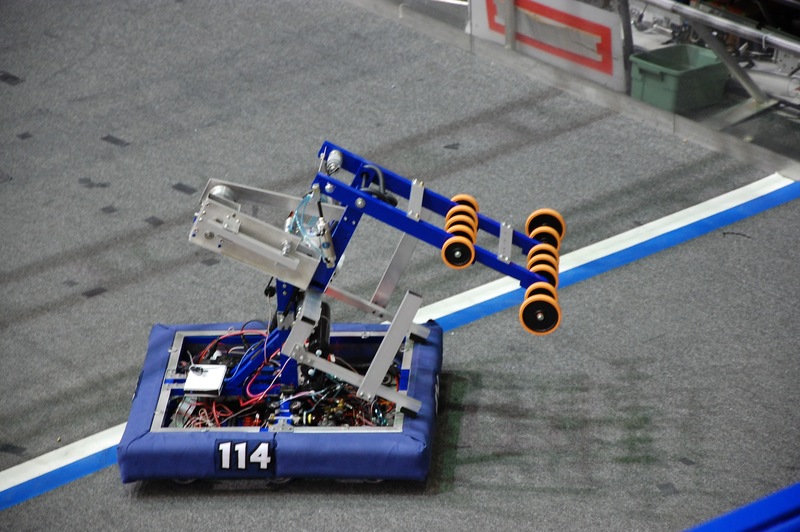 Since most of the teams don’t have access to a field often (if at all), it allowed them to tune their robots so that they score, pass, catch, and move better. While the other teams were testing their robots, we were finishing the wiring on our practice and competition robots. 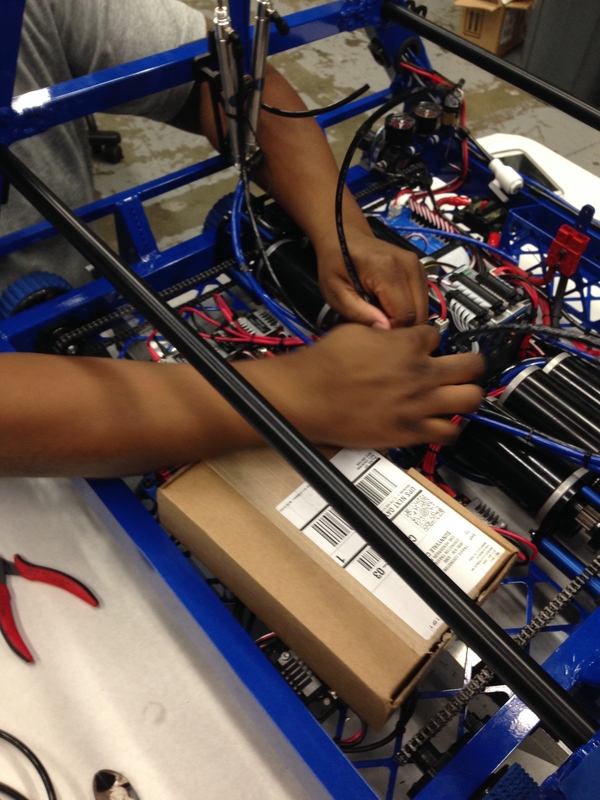 Specifically, we were working on wiring bump sensors and Intakes. We also worked on finishing the hood. 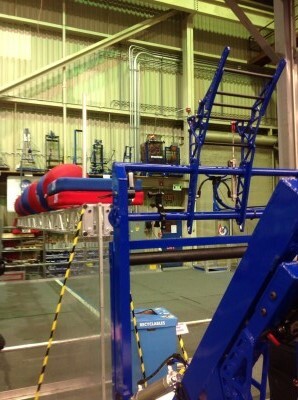 Aside from a couple of parts and wires, the robot is mostly built. 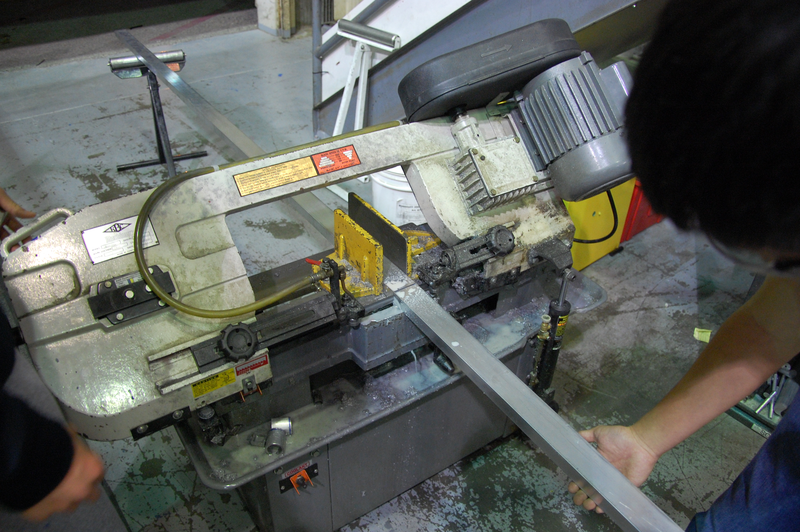 A Couple of our team members worked on manufacturing piston parts, and a couple of members worked on assembling the bumpers. 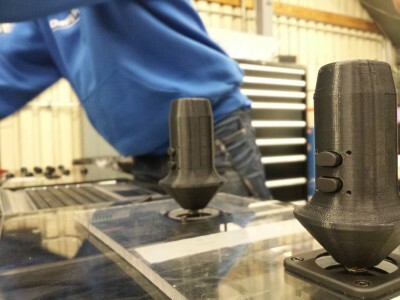 The pistons that they are working on create a unique linkage between two pistons where one piston “locks” the other piston in place so that the rear intake can be locked up when shooting. 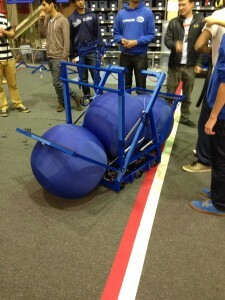 The bumper team started making two blue bumpers. Students affixed pool noodles along each side of the wood bumper frame with gaffers tape. 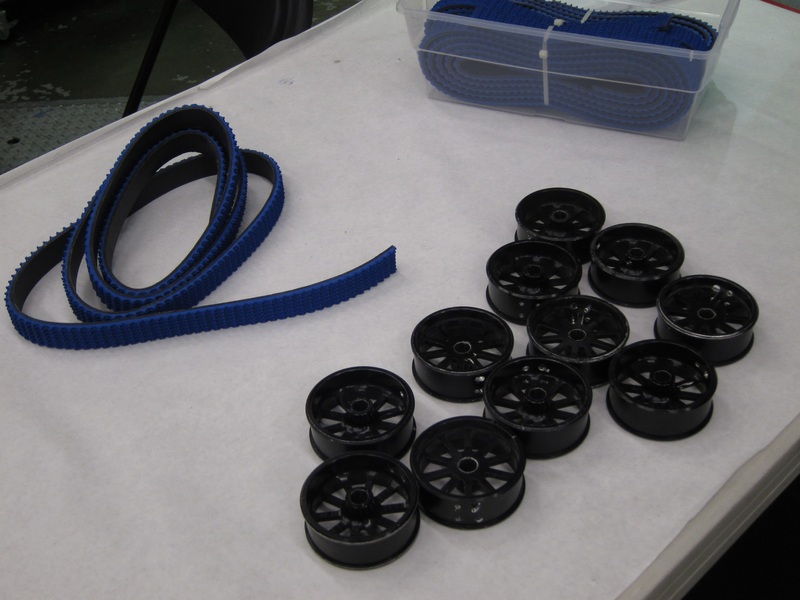 Then, they stretched a full loop of cordura fabric around each bumper and stapled it down along the inside. 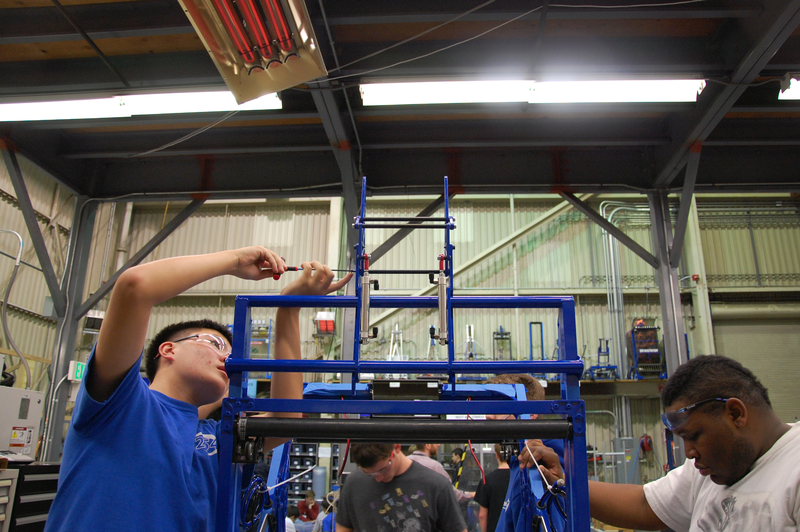 Students took extra care to eliminate as many wrinkles as possible on the bumper fabric. 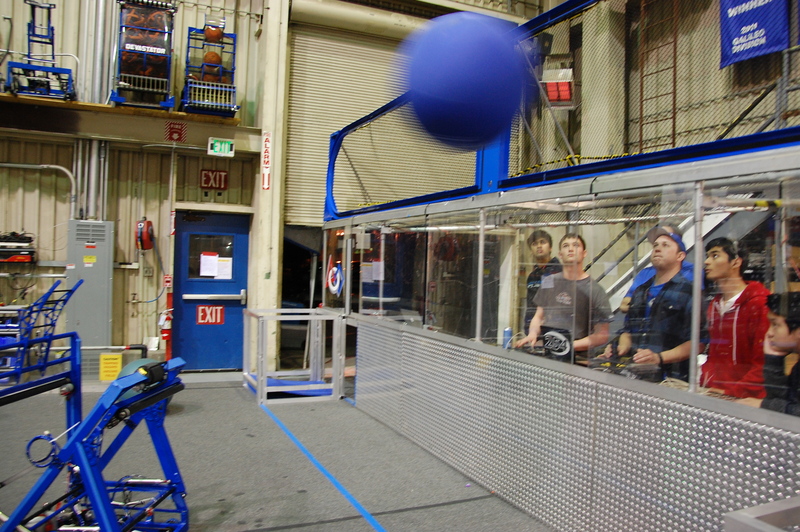 As students tested the robot shooter, they noticed that the ball was being impeded by something before it touched the shooter flywheel. 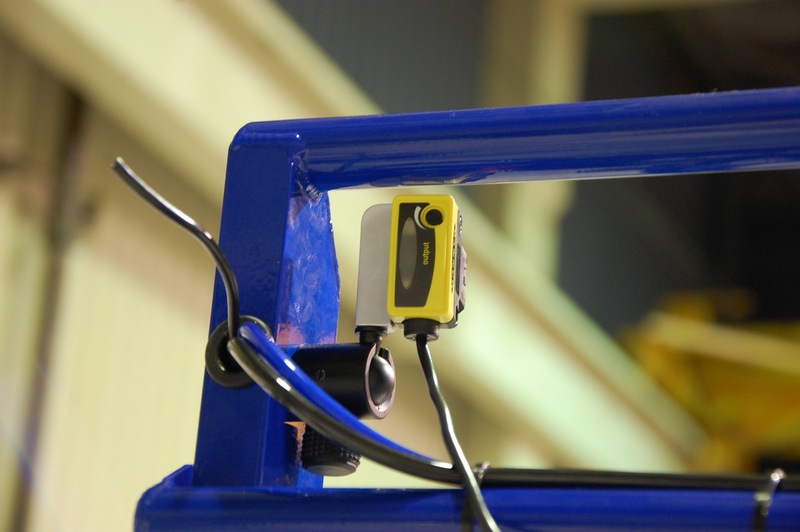 Using a slow-motion camera, they were able to observe the process of the clappers pushing the ball up the shooter. 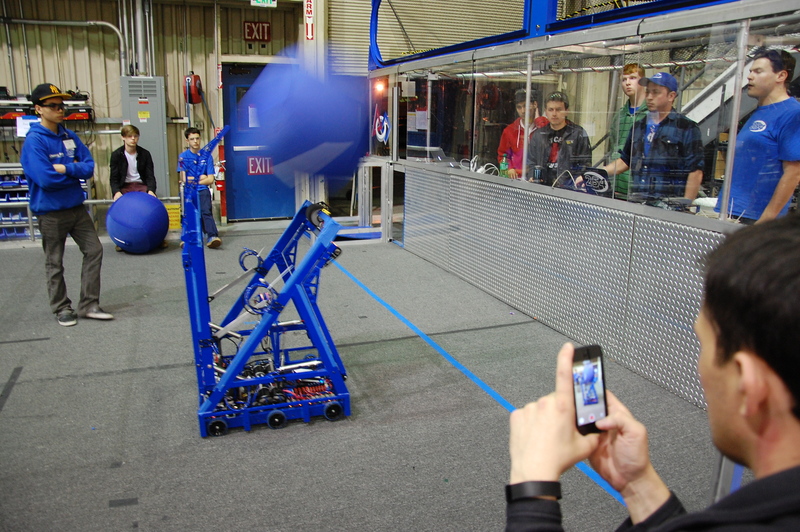 Programmers adjusted the timing of the clappers to push the ball up vertically. 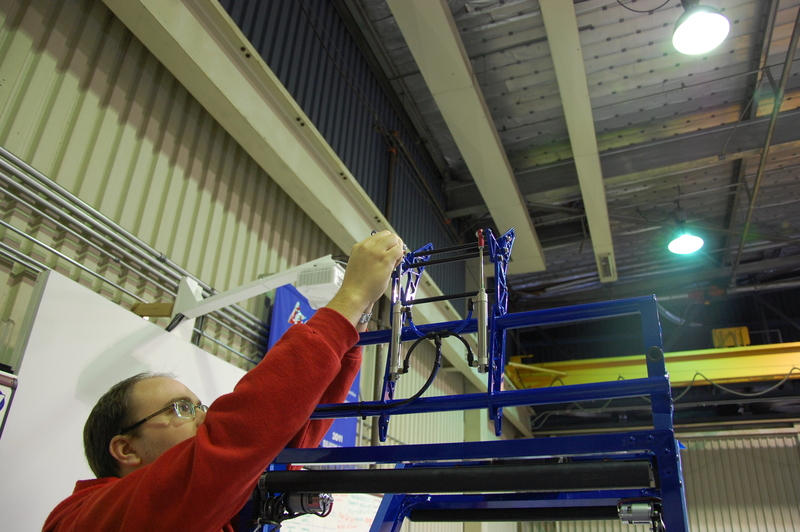 Then, they adjusted the power of the clapper pistons to optimize each shot. 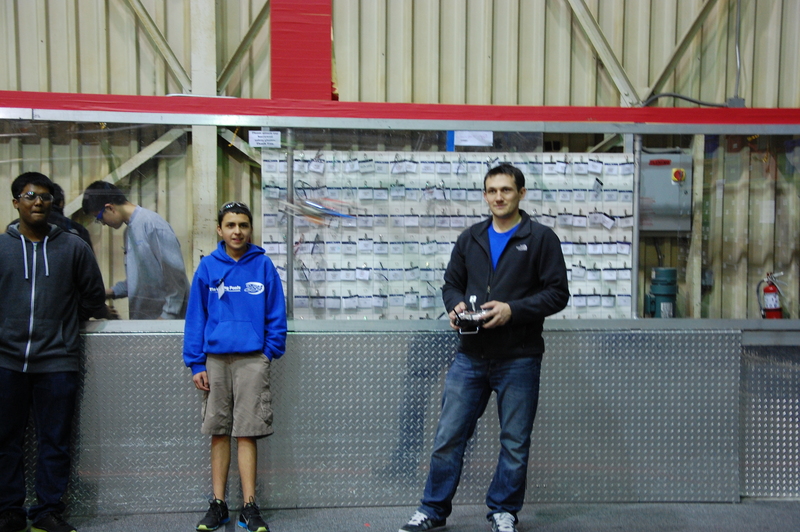 Enjoying some quadcopter "Aerial Assault"
Students started organizing pieces of wood and scrap outside. This was for the scrimmage teams so that they could find parts easily and better make use of our facilities. The current 2014 robots, Barrage and practice Barrage (P-Barrage? Parrage? 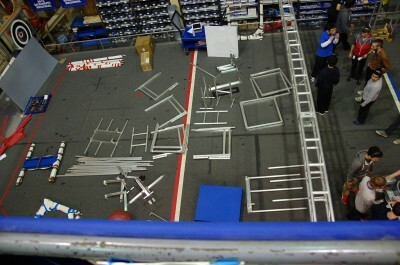 ), were carefully and safely brought to tables on the upper floor of the lab. 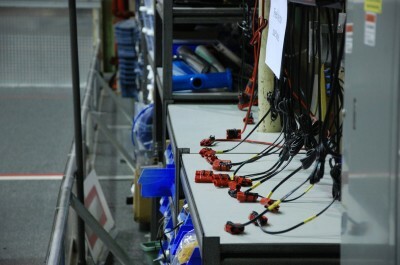 Also, because there will be many teams on day 43 and 44, the team organized the battery charging area. 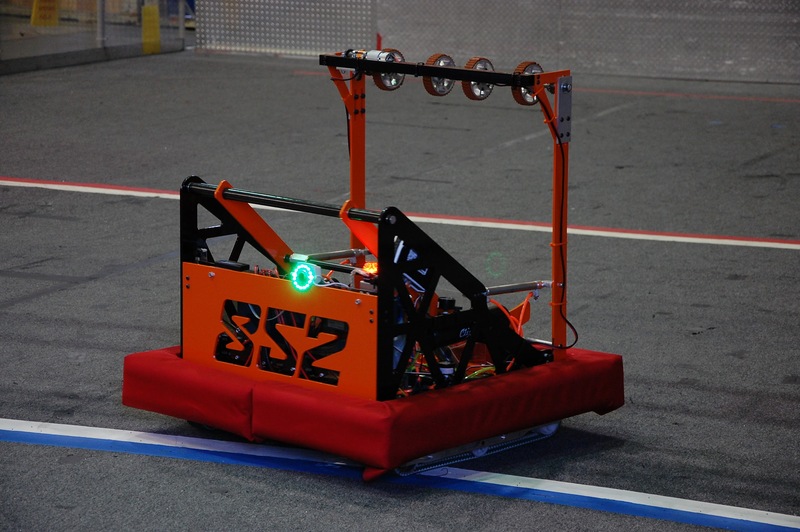 During the scrimmage the team will not only be charging other team’s robots, but will give its own batteries to other teams so that they can more efficiently drive and test their robots. 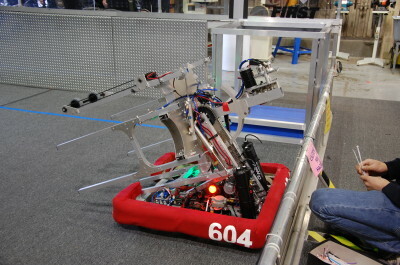 Students packed the twin Overkills as well as the 2012 robot Skyfire into a mentor's car to be transported to the VEX lab so that they would not contribute to the chaos in the scrimmage. 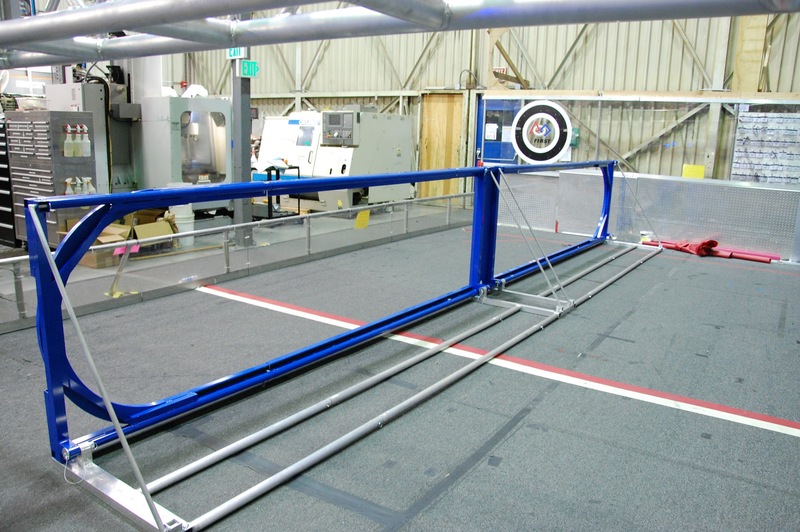 As for the field, the visiting teams would need to test their scoring in both goals, so the team added a net to the blue goal. 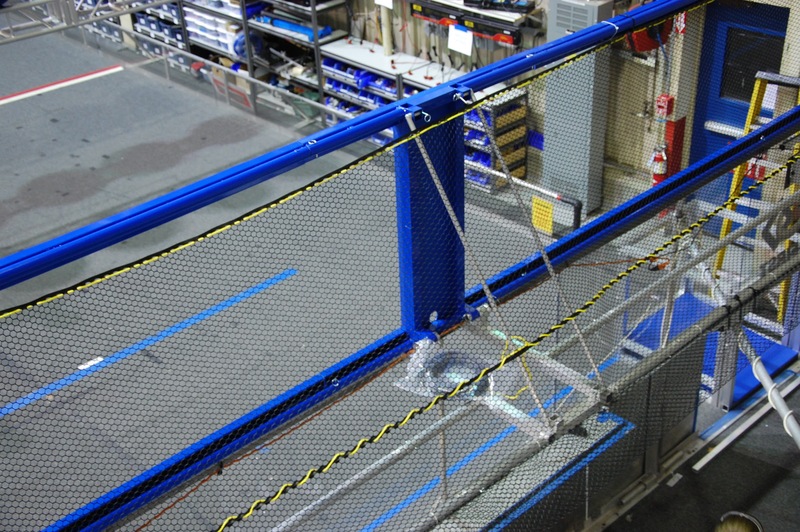 This would keep the balls that are scored from damaging the parts and machines behind the goal and hurting any drivers below. The final part was cleaning the shelves and putting away the tools and parts. 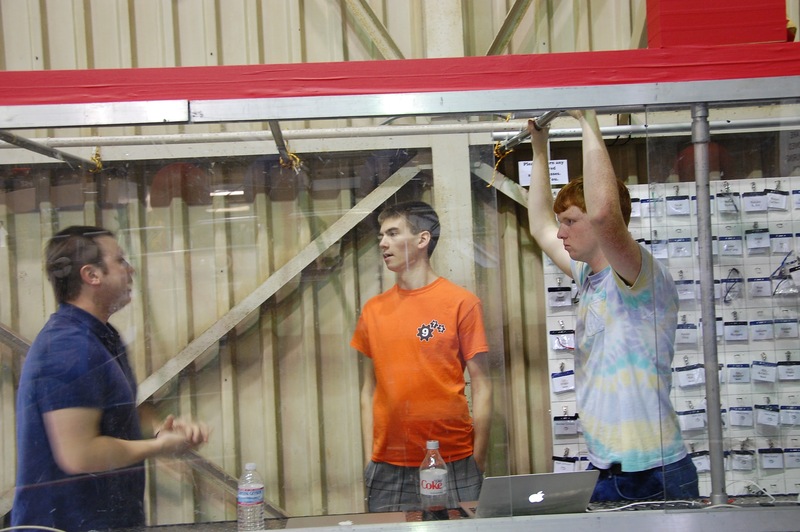 Organizing and cleaning the shelves will make it easier for the team and others to find parts, but it will also lessen the team's struggles find parts in the future. 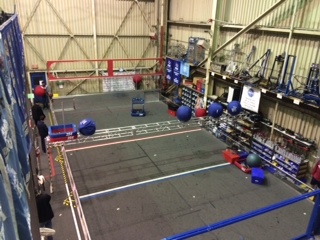 For example, the team moved monitors from behind the driver control stations to the area near the drill presses (the southern walls). 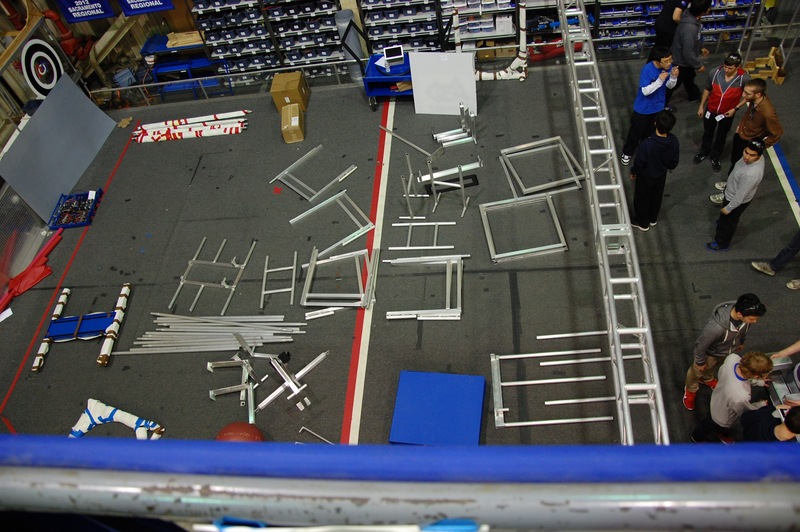 Upon realizing this created a mess as well, the team later moved those monitors outside and dismantled the shelves holding them. In addition, students moved the mess next to the east wall to the upper floor. This mess included the computer monitors plus the lost and found. 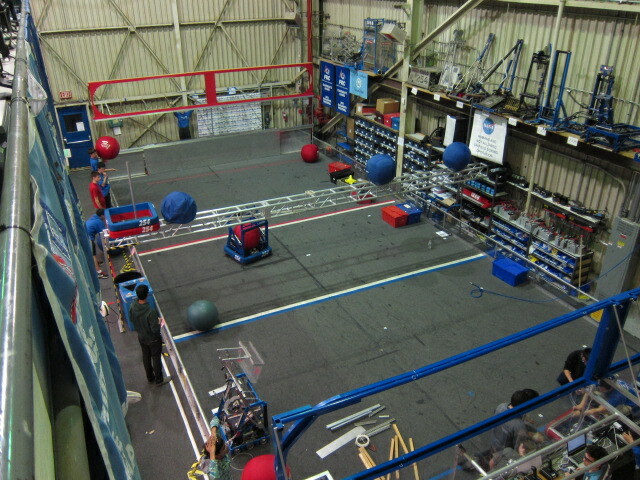 Also, students vacuumed all floors, including the competition field, of all metallic bits. This was achieved using a combination of manual labor and the Roomba (Consuela). Finally , students built a new shelf for driver stations. 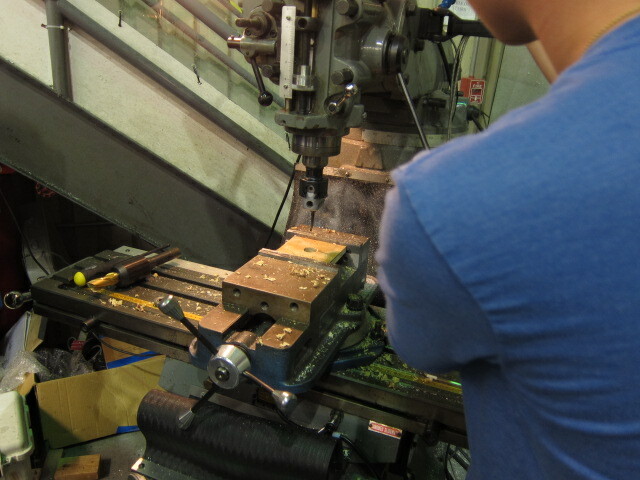 Although most of today’s time was spent on cleaning, the team managed to machine some parts as well. 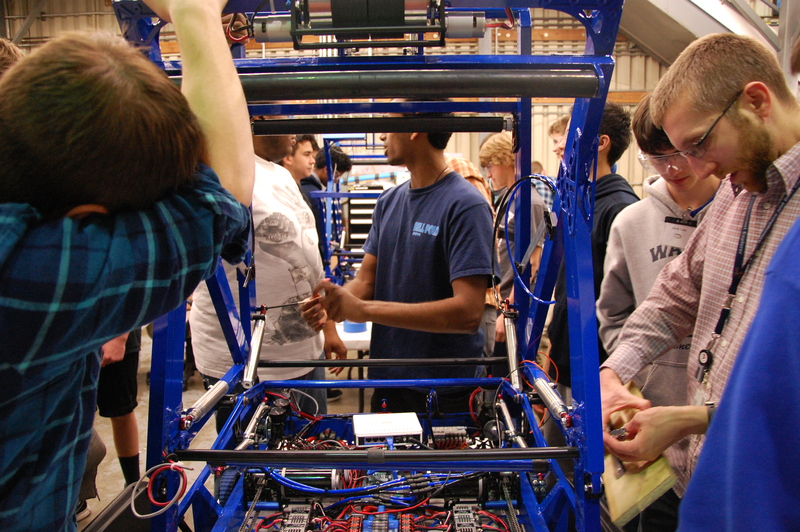 Notably, the team got the flywheel powder coated and the bumper to work. 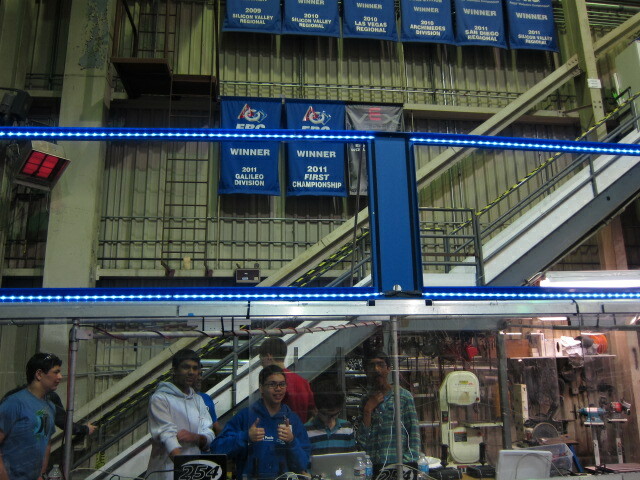 The programming team programmed the collage for the giant display screen in the pit during competitions. The essay team worked on the Woodie Flowers essay today. They revised the latest draft, as the essay will be due on bag and tag day. Work began on assembling the field today. 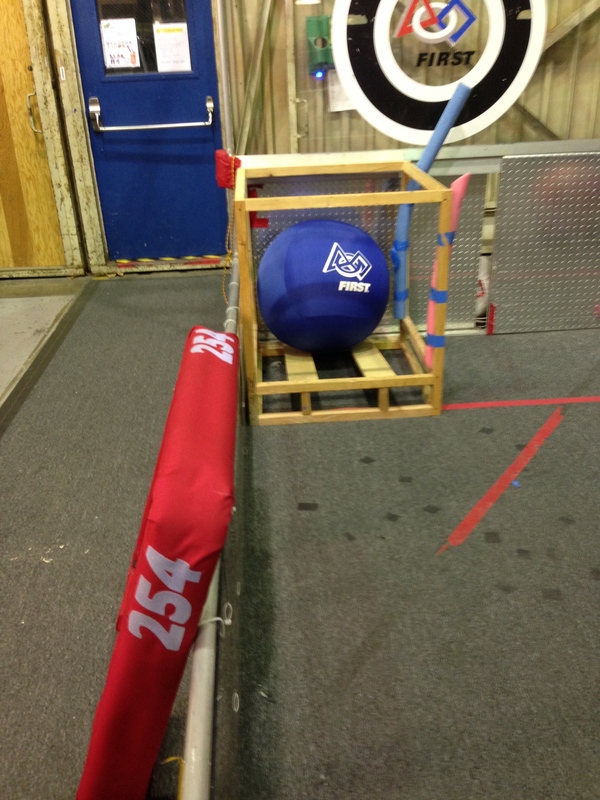 We first opened up all of the shipping pallets containing the field elements and laid them out on the field. 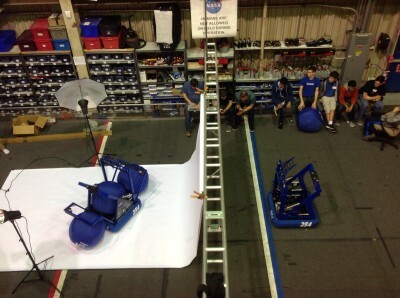 The assembling crew started with the low goal. 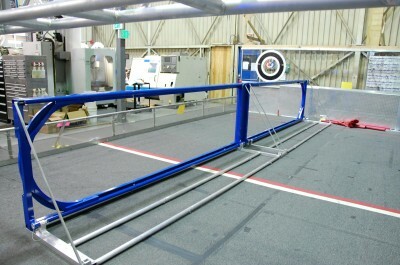 They assembled the two blue low goals and then moved onto the blue high goal. 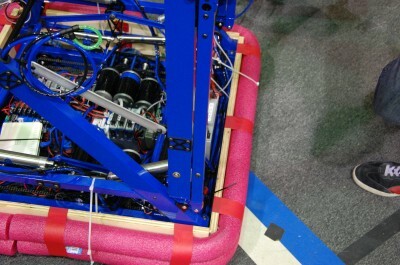 They assembled the goal including the overhang to protect the drive station. They then attached the poles on the truss that represent the limits of the field above the truss. 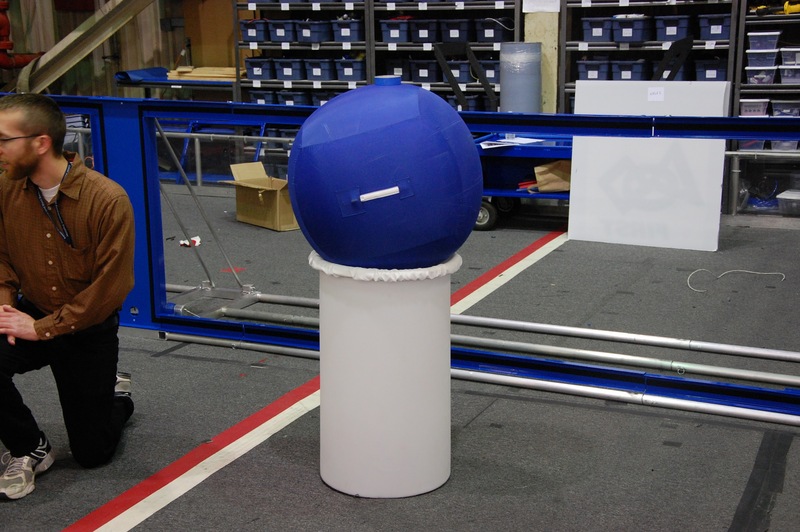 The field team also assembled one of the podiums for the ball to rest on behind the driver station. 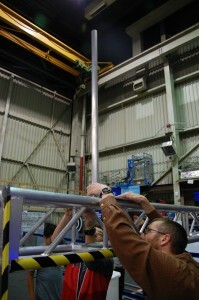 A few people attached another stabilizing to the base of the polycarb at the end of the truss. The wiring team, lead by EJ and Mani, wired the banebot motors that drive the intakes as well as the encoders attached to them. They also wired the VEX button sensors that keep the ball stationary in the intakes. 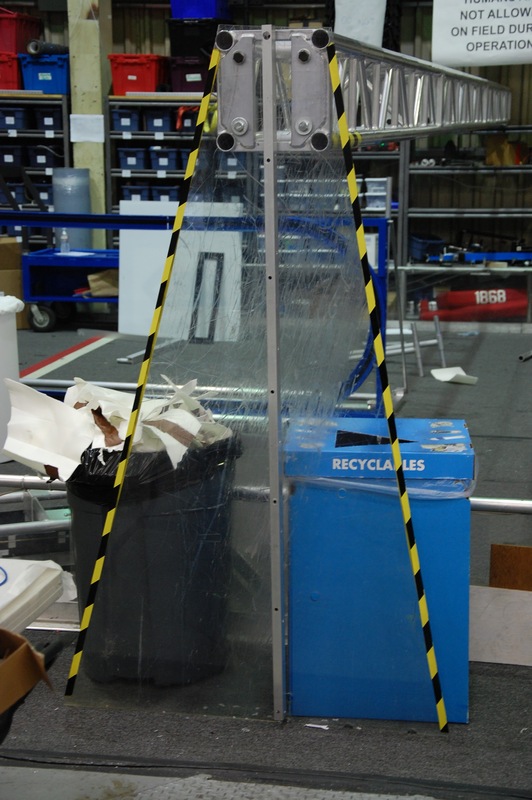 For driving and testing purposes, they wired a single pneumatic tank to the comp robot. 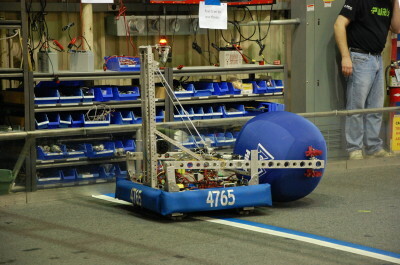 The bumpers were successful attached to the practice robot to allow the robot to be driven around and tested. 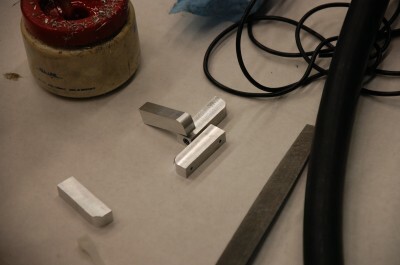 Parts for the intake encoder mountings and the hot goal sensor mountings were manufactured today. The wooden sides for the bumpers were also manufactured. 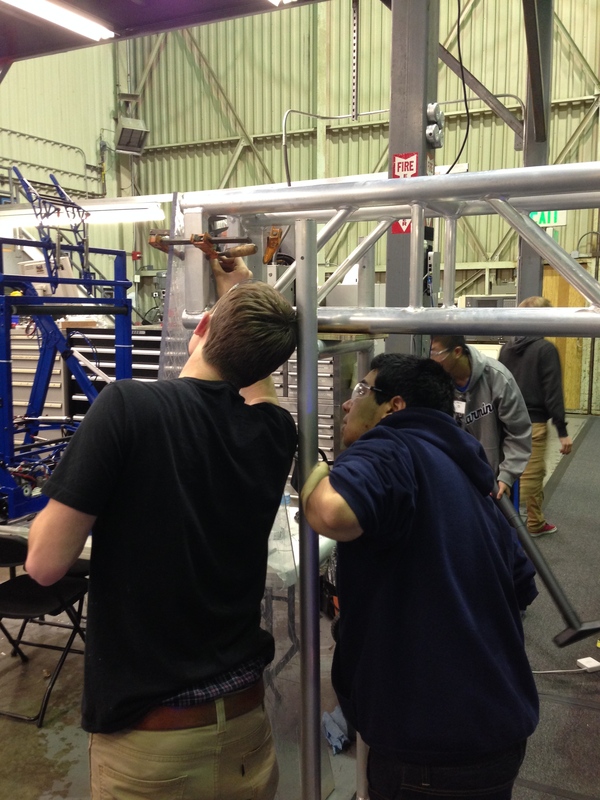 Today, our team worked to address some problems in our intake and truss. We also worked on programming an important system in our robot. 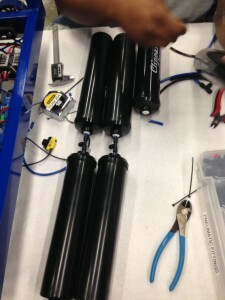 Our team worked to install and improve our intake system. First, our team changed out the bent arms in our robot and installed some gearboxes and motors. Next, we drilled grommet holes and finished up some wiring. Lastly, we used pneumatic wiring to further improve our intake system. 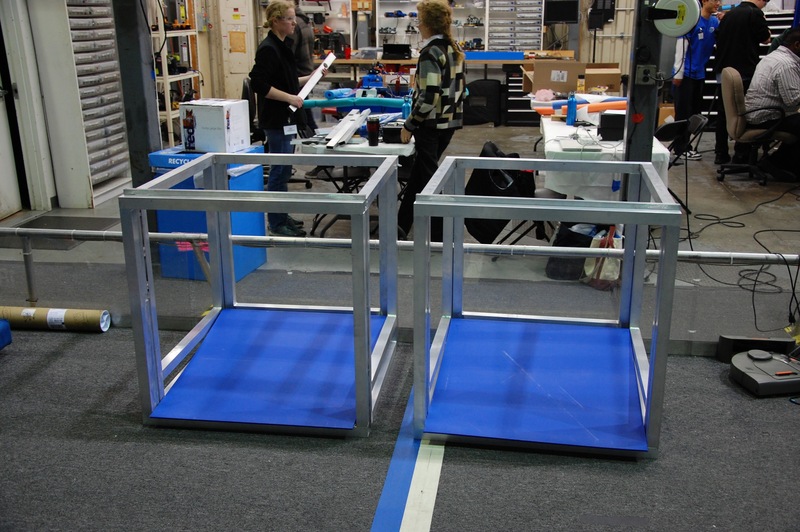 Some students created intake holders very important to the success of the robot. In order to make the truss more stable and reliable students made a bar that would ensure that it would work correctly. The robot needed a system that would allow it to quickly ready its ball to pass or shoot for a goal. 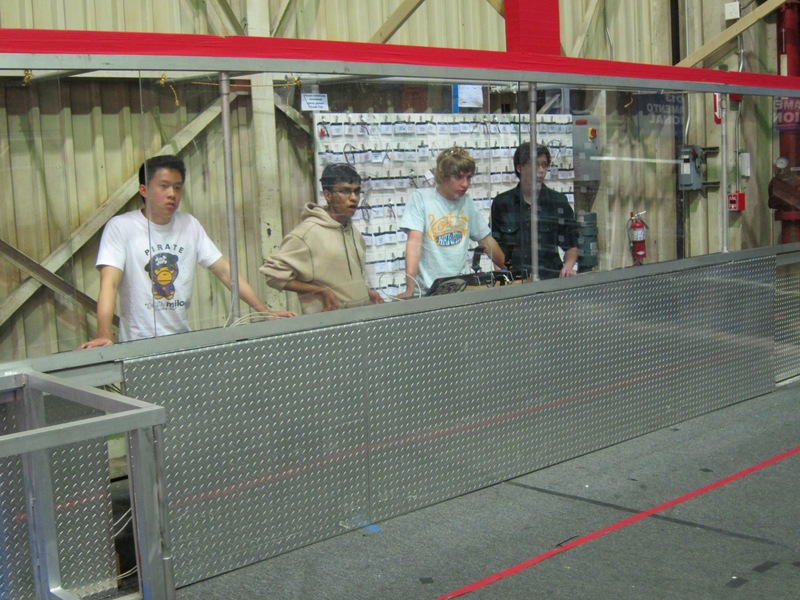 The team programmed the robot so it could quickly move through several pre-made states and shoot at a goal. Today the team spent a lot of time assembling both the practice and competition robots. 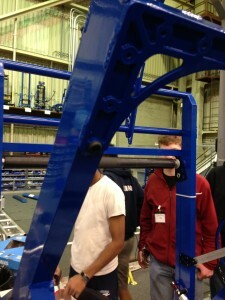 Students added rubber bumpers to the superstructure using rivets. This prevents the front intake from hitting the superstructure and damaging it. Students helped finish plumbing the pinniped on the competition robot and Practice robot. The two sides of the pinniped can be fired independently. Students also plumbed the cylinders on the gearbox for the competition robot. Students assembled the truss, and mounted it on the field. 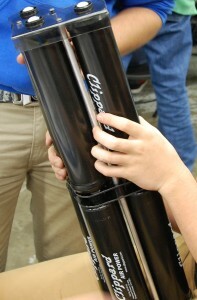 The drive base and the pinniped were tested. They worked well and the drivers were able to score in the low goal. 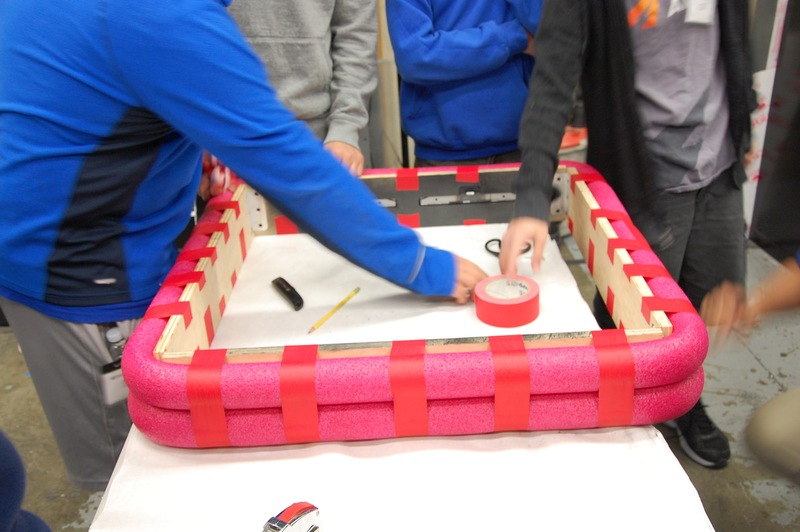 Today, students continued construction of the bumpers. 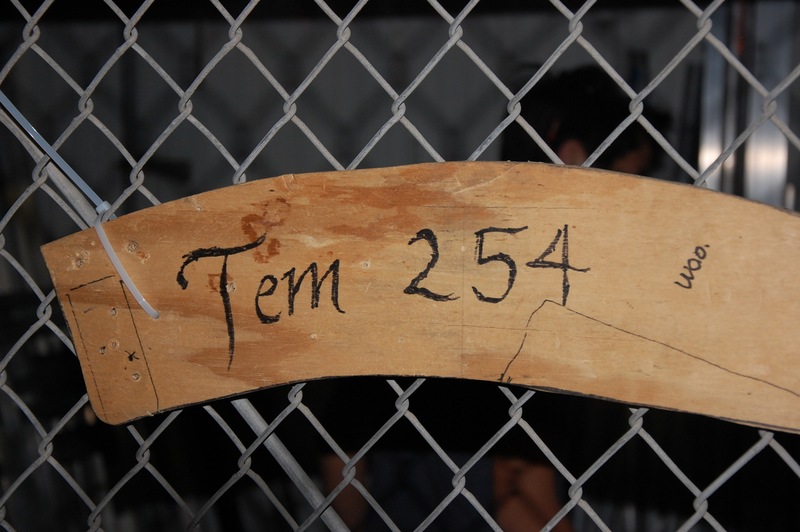 On the pieces of cut Cordura they marked 4 inch by 12 inch boxes onto which 254’s team number will later be embroidered. 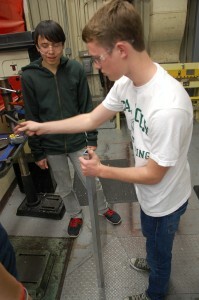 Some students machined two pieces of tubing that will be used to hold up the shooting arm on the robot. These will temporarily be used for testing purposes until pistons will replace them. 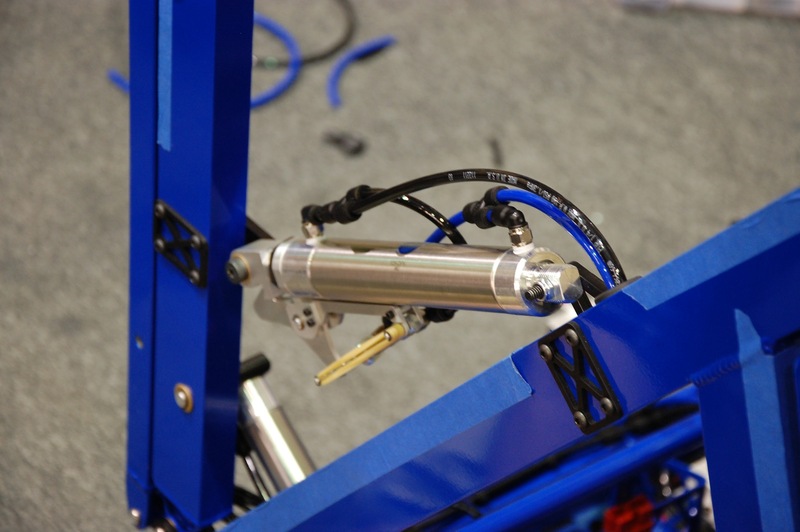 Some students and a mentor worked on the competition robot by attaching and organizing pneumatic tubing on its drive base. 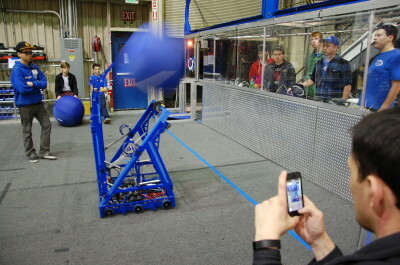 Later on, the mentors and a group of students began testing the robot’s shooter and were able to score into the high goal. Today a group of students continued writing and editing 254’s submission for the Chairman’s Award. A few other students created a to do list stating what would need to be done to complete the Media and Technology Innovation Award.